The sheer numbers of Buddhist sacred items being sold by the Chinese Communists on the internet indicate a long struggle that Buddhists obviously have not won. Why would someone sell their prayer beads? Is this really something that should be found in these kinds of numbers, particularly when they are all being sold by Chinese sellers when so many of them are Tibetan? Often antique beads are being sold as “new without tags” which also indicates a cover up of possible other wrongdoing besides just lying about the condition of items to get more money for them- since they could have gotten more money by telling the truth about their age and prior use. 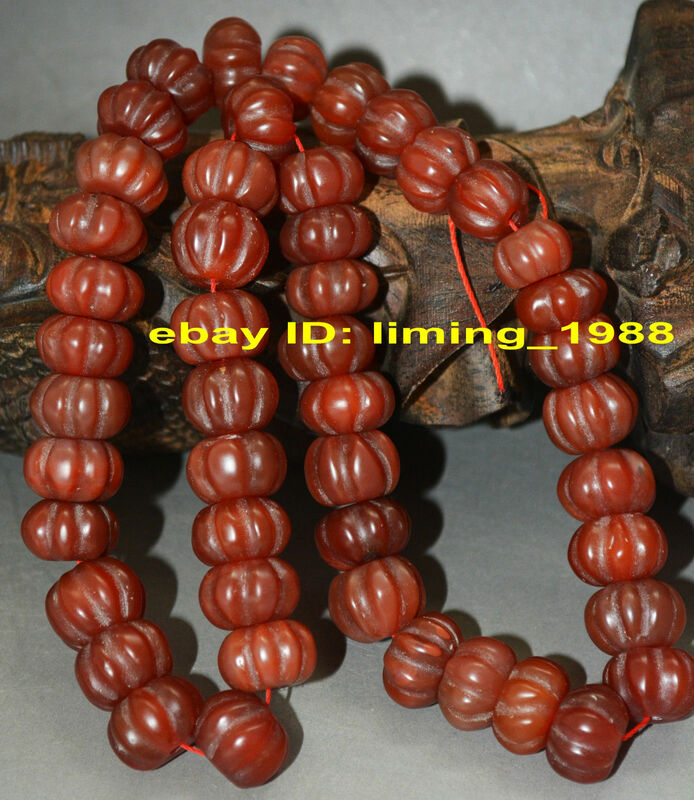 Though I’ve tried to purchase a mala that is NEW from Ebay- Buddhist prayer beads that help the user to count how many times a prayer is repeated- not one that I’ve purchased has been. With beads it is fairly clear when they’ve been used, particularly for prayers because the beads rub together. This wear can often be seen with the naked eye, but a 10x hand lens also helps to identify prior use. Most people I would suppose don’t pay any attention, or are just happy to get whatever it is for as cheap a price as they do, but then, I wouldn’t want to argue with a group of people that have killed thousands if not millions of innocent Buddhist monks either. Since I’ve been tracking how much is being sold on Ebay as well as questioning specific sellers as well as getting banned for saying items are used, the numbers for sale have only increased. I believe this is part of the tactic for selling these used items- to flood the market with so many sellers that it is impossible to keep track of them all- let alone hold them personally accountable. If you only have one thief to catch, it is much easier than catching 1,000. Often Chinese sellers use multiple aliases, so though the numbers of items for sale have increased, and perhaps the total number of sellers on Ebay, this doesn’t necessarily mean that the goods are being dispersed to more sellers in any sort of equitable way. But the increased numbers of Tibetan and other minorities personal items for sale may indicate increased theft of their personal property, either through forcible evictions from traditional settlements in which their houses are typically bulldozed to make way for new construction, and/or because the items were confiscated from individuals that were arrested in increasing numbers as of late. So there is only silence as the money changes hands and no one is the wiser as to what goes on in the backroom. 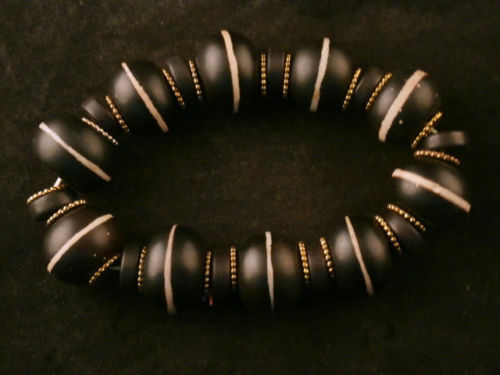 It really violates the very principle of these beads to begin with to have them be obtained in such nefarious ways then the proceeds used to incarcerate or murder others or benefit posh party members’ international penthouses for all we know. It is only through the complete and total lack of compassion have so many of these beads ended up being sold in the marketplace as such. Sandalwood is some of the cheapest for poor monks and ordinary Tibetans & Chinese to purchase when they were new, therefore occur in the greatest numbers. 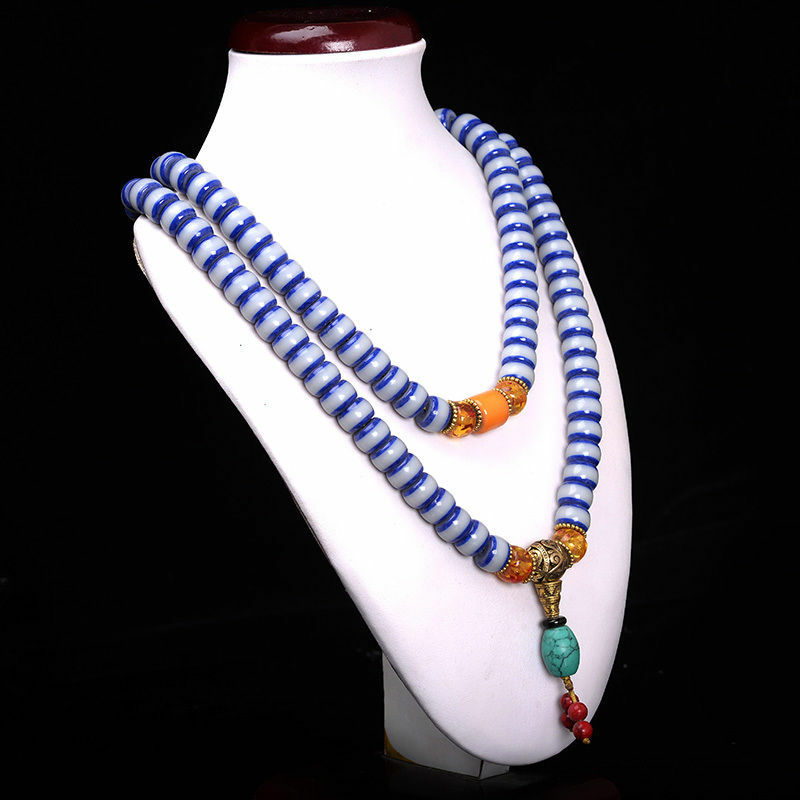 Because the supply is very high and the demand for these types of beads- very plain and unadorned compared to lapis or turquoise or amber- is very low, they are typically sold for less than what it would cost to ship the item ordinarily. You know that the Chinese government wants to get rid of it if it sells it to you for a quarter, then ships it for free. There isn’t anyone making any money there, and if anything the Chinese communists are loosing money by being such misers and wanting to keep and sell anything of any value. Every one of the sellers above are using the exact same photograph though they supposedly are completely different sellers, highly suspicious since the prayer beads seem to all be used instead of new from a factory. The metal charm (a dorje) on the prayer beads above arrived completely oxidized with a whitish salt, while others in the same package had none- so it couldn’t have tarnished to that degree because of where they were being stored. The beads also showed many others signs of previous wear, just like all the malas for sale by the Chinese on Ebay that I’ve personally inspected (over 20 now from different sellers). I’ve also tried paying more for the same mala just to see if it was just some used ones that were being discounted, but they were equally as used. Often the beads have been restrung, but the holes on the beads themselves still tell where they’ve been and that they are not new. The enormous volume being sold, the number of lies and cover ups really only indicates one thing. 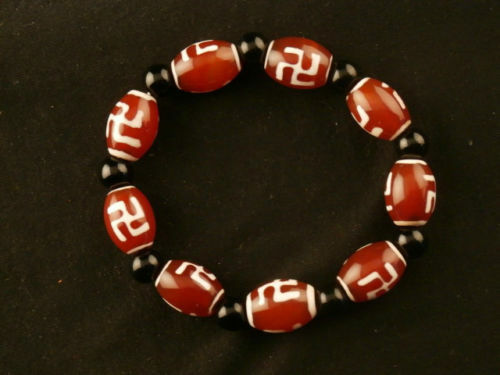 Its really a pretty evil thing to take someone’s prayer beads, lie about them and sell them, and I’m sure we aren’t getting the full story of what is really going on in China and Tibet without actually looking at the physical evidence. This sandalwood bracelet was sold to me as “new with tags” along with 2 others, but as you can see, they’ve been well used before. Below is the seller’s photo of the item which looks very new indeed. I left this seller feedback saying the item was used, and they’ve harrassed me for a month to recend my feedback. I can’t even report their harassment to Ebay because as far as I know, as long as they keep lying with a smile on their face, they aren’t breaking any rules. The moment they say a swear word, or threaten me, I could report them as harassment though. But just emailing a person day after day, week after week asking them to lie for you isn’t illegal at all apparently and A-OK with Ebay. 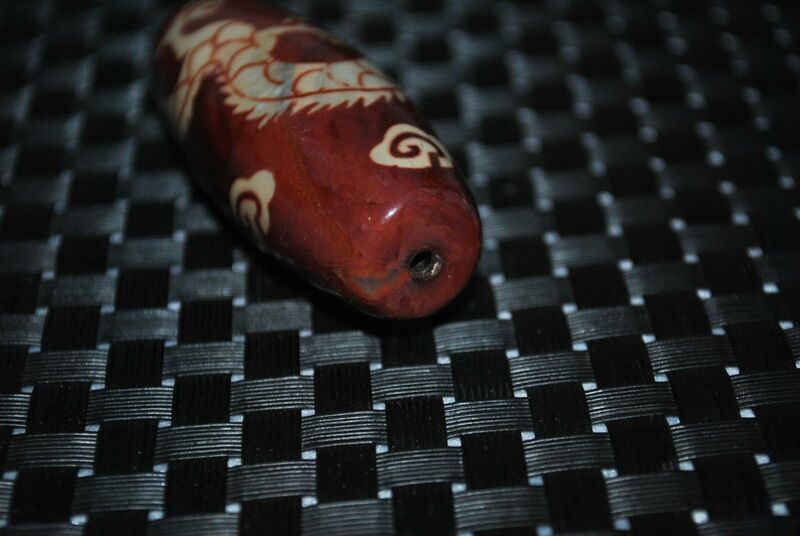 These beads also show clear wear in the photographs- there are scuffs and scratches, part of the lacquer (or varnish) on the outside is completely worn through in spots and you can see even dirt in the closeup photo below attached to Kwanyin’s head. 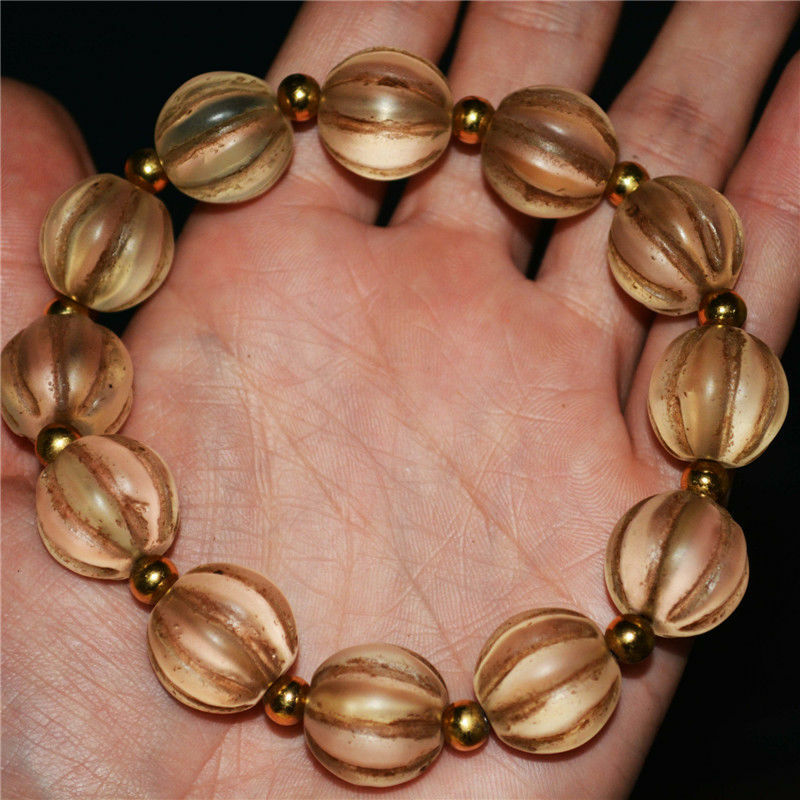 One of the wengewood malas I bought above, used, like all the rest the Chinese are selling. Very, very used, but still sold as brand new. Where is its rightful owner now? Dead? Imprisoned? Siddhartha is said to have gained enlightenment underneath a Bodhi tree- a type of fig in India- thus all Bodhi trees and their seeds are considered sacred. But it is tough to figure out from Ebay sellers and the internet exactly which seeds are real Bodhi tree seeds, different sizes, shapes and colors are all being called “bodhi” from the whitest of whites to the ancient grey and cracked. 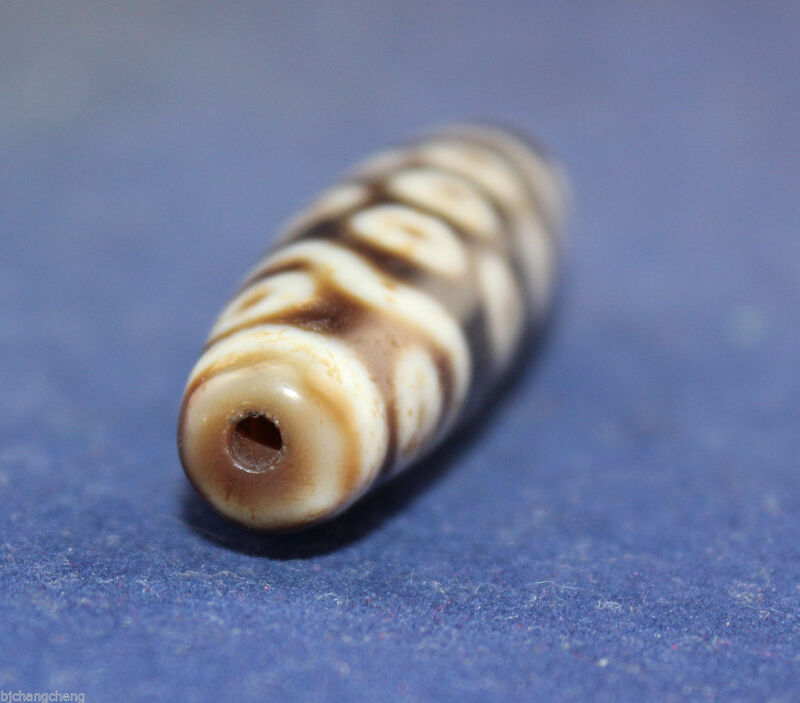 In a recent scientific study on Bodhi beads in China they identified 47 different species of plants that were used to make the beads, many unrelated species. 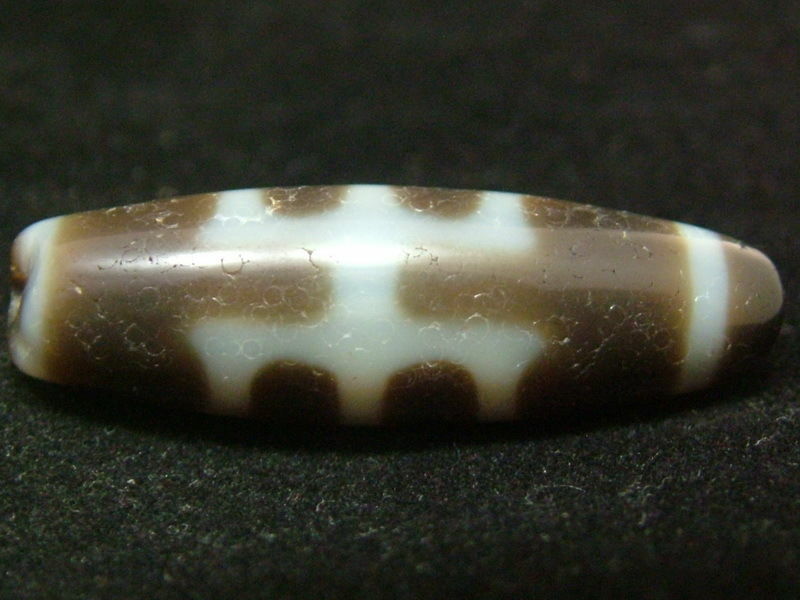 The beads above are called “moon and star” bodhi beads and are made from a plant called Daemonorops jenkinsiana. 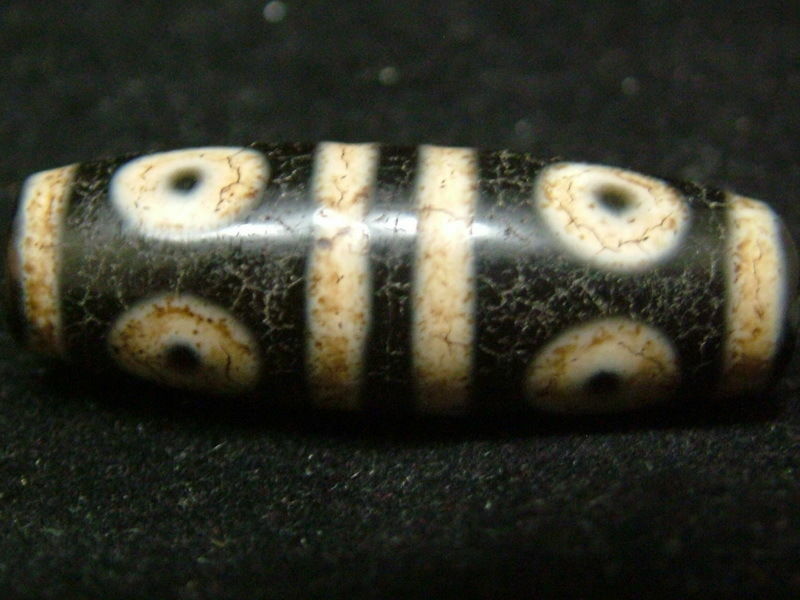 This plant grows in Southern China, India, Nepa, Bhutan and Bangladesh, but not Tibet, however a research study found many of these beads- very old- in Tibet. 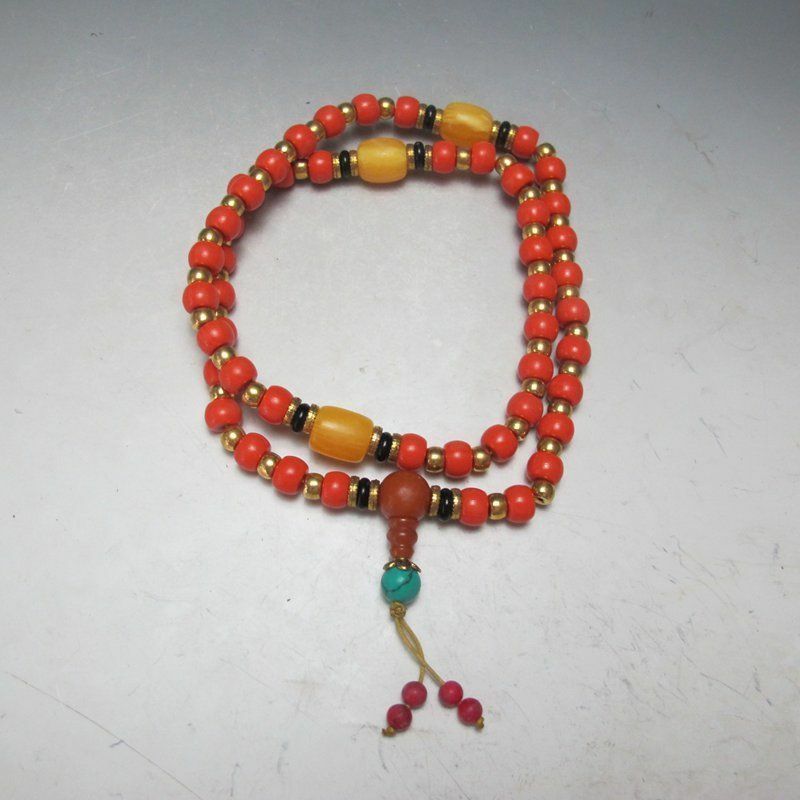 Part of the reason seeds of plants were used for prayer beads and considered to be so sacred in Tibet is the high altitude and the fact many of them don’t grow there and had to be imported, making them even more valuable and rare. There are also a number of fake “moon and star” Bodhi beads on Ebay- the mala above may be an example of this- which are made from plastic, but are still previously used and no less sacred if they came from someone whose things were stolen, and possibly their life taken too. Bodhi root beads are made not from roots, but from the seed of Corypha umbraculifera, a species native to India and Sri Lanka that was widely planted in temple gardens in China because its leaves- soft and flexible when dry- that were used to record sutras, and other writings. 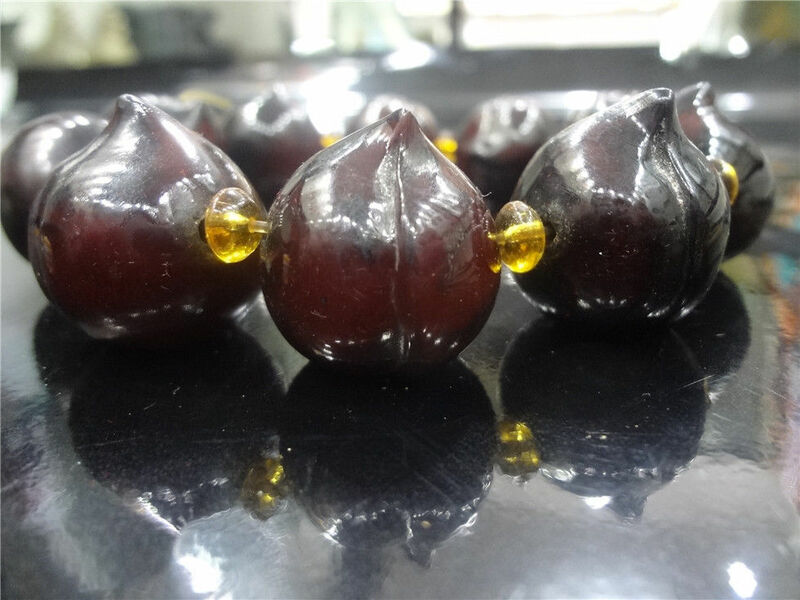 Another type of seed widely used for Bodhi beads in China and Tibet are called “Phoenix eye” bodhi beads and “small Phoenix eye” are the species Ziziphus abyssinica and Ziziphus jujubavar. spinosa. The “eye” is formed at the end of the seed like what is seen below. And yet one more type of seed commonly used for sacred prayer beads are peach pits. Widely beloved for their sweet flesh and fuzzy skin, they are also symbolic of longevity in China. These prayer beads made from pits are quite well worn, but still being sold as brand new more often than not. 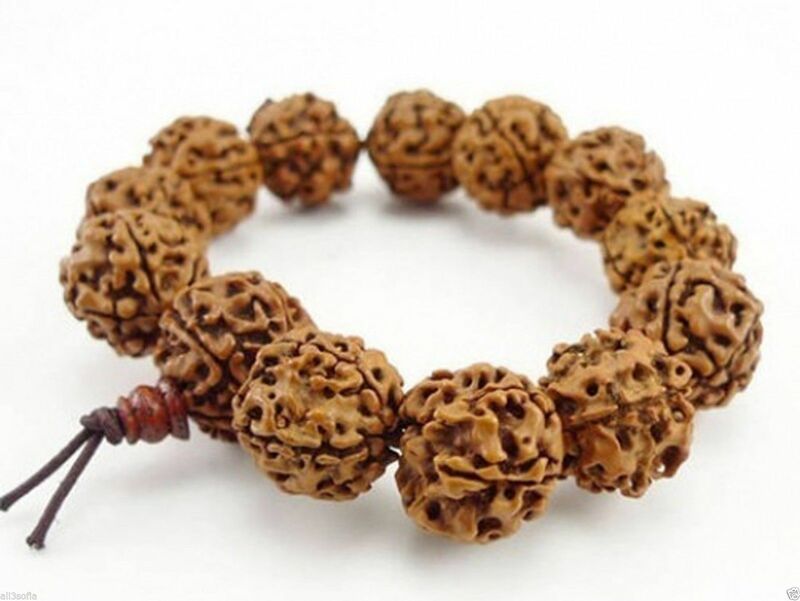 Rudraksha seeds, also called “King Kong” is the most common type of Bodhi bead in China. Made from the seeds of an Elaeocarpus species- most commonly Elaeocarpus angustifolius. A ‘Two-furrowed King Kong’ is made from the fruit of Elaeocarpus hainanensis. Rudraksha beads have been used by Hindus as rosaries from at least the 10th century and may be the earliest form of prayer beads in India. One Hindu legend says that once Lord Shiva opened his eyes after a long period yogic meditation, and because of extreme fulfillment he shed a tear. This single tear from Shiva’s eye grew into the rudraksha tree. It is believed that by wearing the rudraksha bead one will have the protection of Lord Shiva wipe away our own tears. The rough surface symbolizes the austere life expected of worshipers. 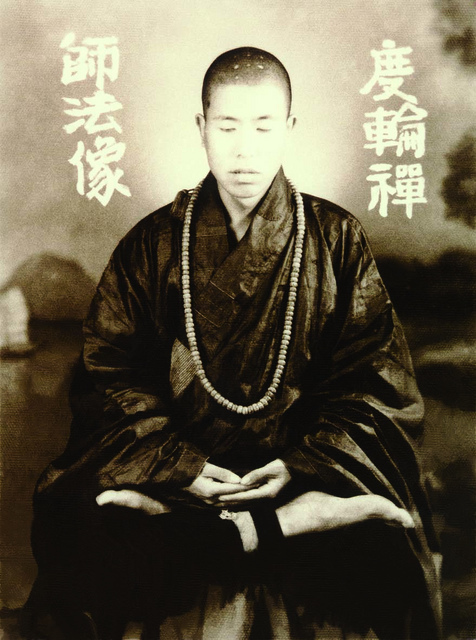 Hsuan Hua, a Chinese monk who brought Chinese Buddhist to the west in 1953 (age 35) wearing a rudraksha seed mala. 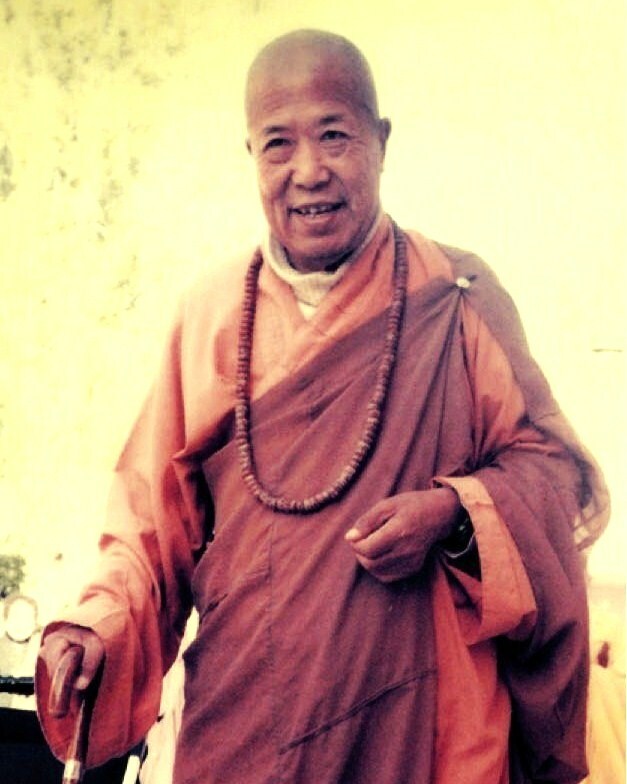 Hsuan Hua later in life, still wearing the same seeds. Part of the reason there are so many bracelets for sale is because they are easy to restring and sell, and because beads from Buddhist malas may have been too damaged to be reused, so they were restrung into bracelets which might also be more wearable to most consumers. -Reference: Seeds used for Bodhi beads in China , Journal of Ethnobiology and Ethnomedicine. Horn from bovine- yak, oxen and cattle, come in a variety of colors. Above is the most common- a deep reddish brown, while below are examples of lighter colors that might have been more expensive to begin with. 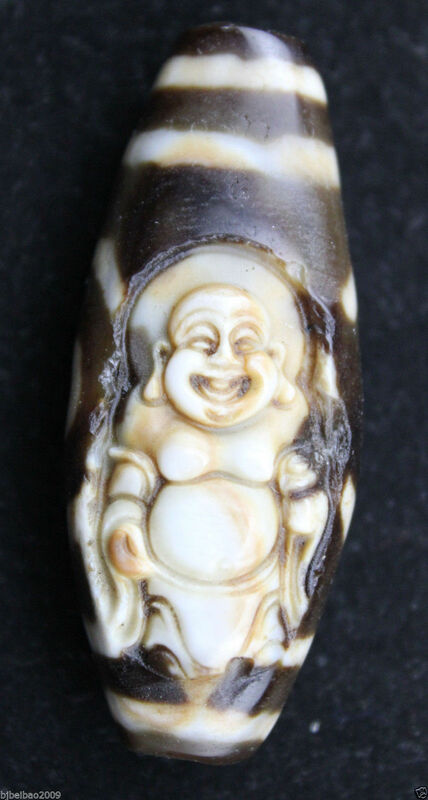 If you notice on Buddha’s faces above he has some yellow-whitish residue around his nose and eyes- this maybe skin or body fat that wasn’t fully cleaned off when these beads were recently restrung since it is that color and many items are suspected to have been robbed from graves, not sold by the living voluntarily. 18 Arhats carved from ox or yak horn. They are the original followers of Buddha who also attained enlightenment, and popular throughout the ages in both China and Tibet. 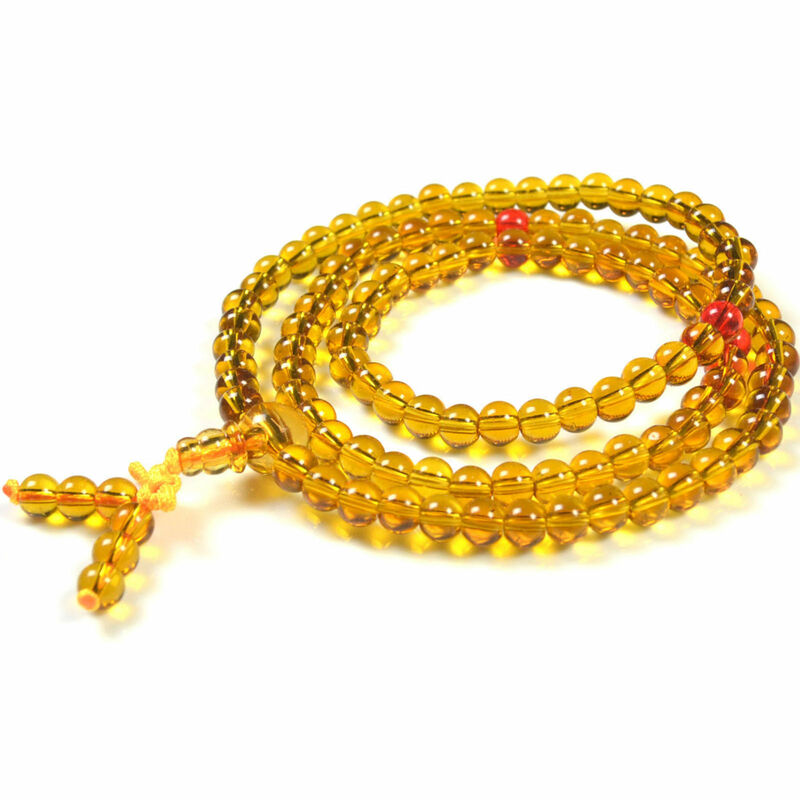 Amber and a synthetic amber called mila is also highly prized for beads in Tibet, prayer beads being no exception. Not only is it very light, but has lustrous qualities unlike any other material and is heat resistant. Amber is fossilized tree sap, and within Tibet and China there was a motherload apparently. 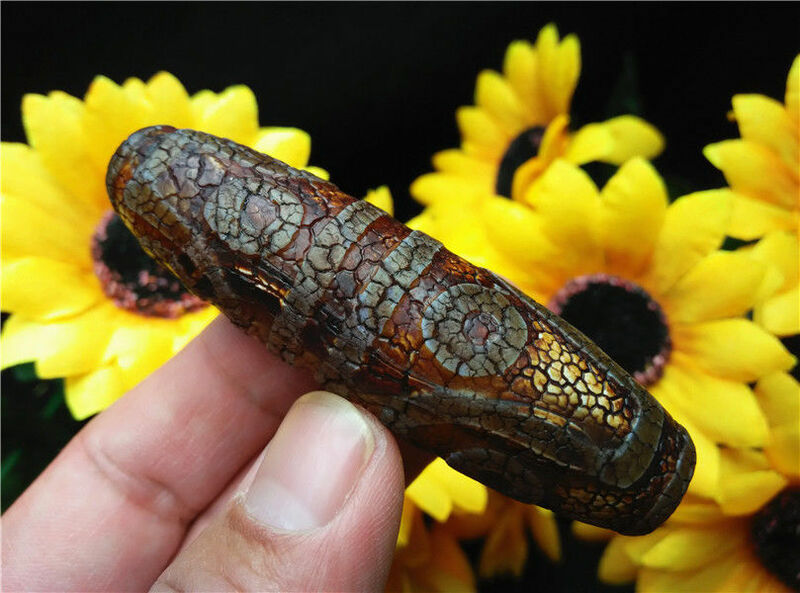 Often sellers of Tibetan goods lie and say that the very real amber is “Baltic” but in all likelihood much of it is indigenous to Tibet and China, like the example above. 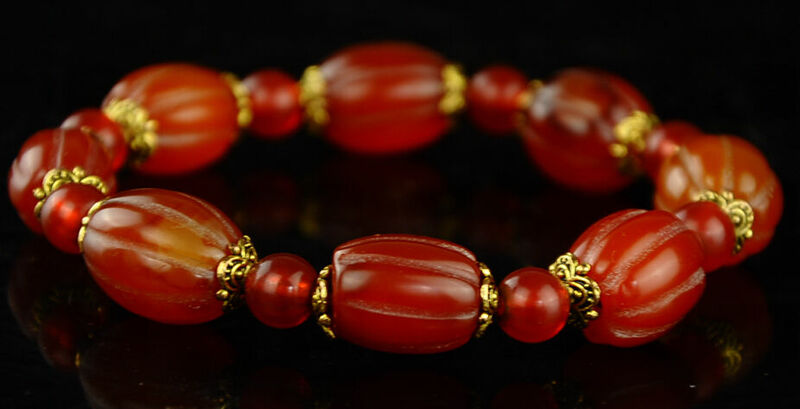 Red coral is another durable material, often used in jewelry. Today it is very expensive because it comes from coral reefs- the real red coral is imported from Italy, Taiwan and Japan- but some of the Tibetan coral may be a fossil coral that they’ve mined and dyed red for centuries. noted a brisk trade in pearls and coral bands, and in 1897 at least it was noted that this coral had come from so far away as Italy. 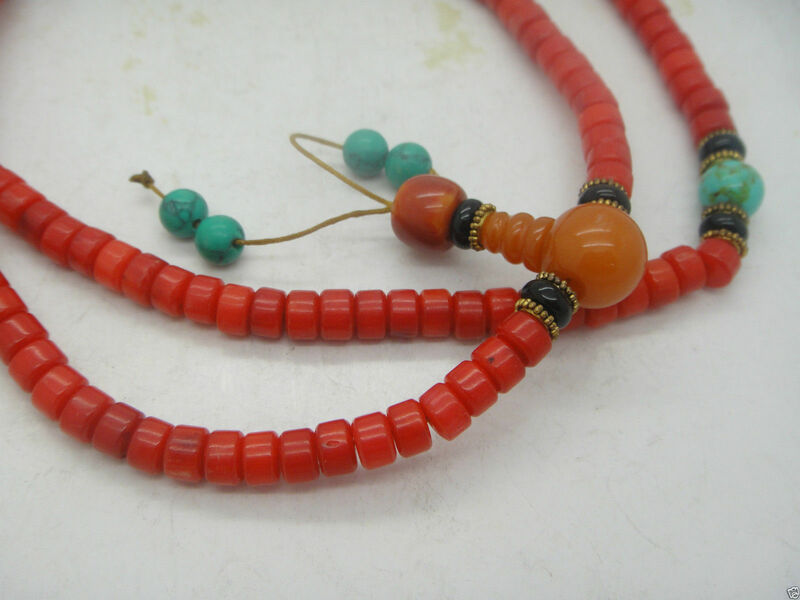 Traill also mentioned this “Meditarranean source” of coral which was exported into Tibet as large scarlet beads. A ready market in pearls was also noted. A slightly more complex mala than the previous example with counters on the sides. 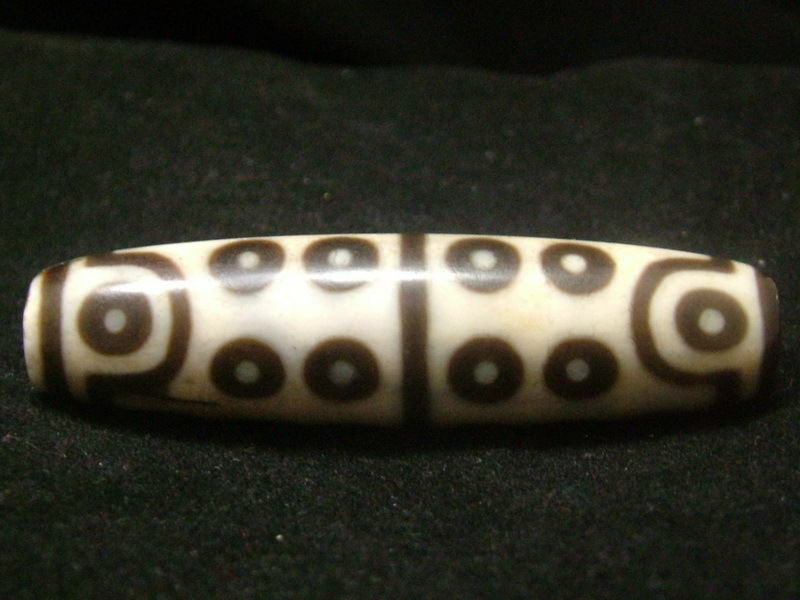 Another form of inlay using turquoise and coral chips in bone. This is a very traditional design and also seen in Nepal, and can be still bought brand new from there. This however, is not new, thought being sold as such. 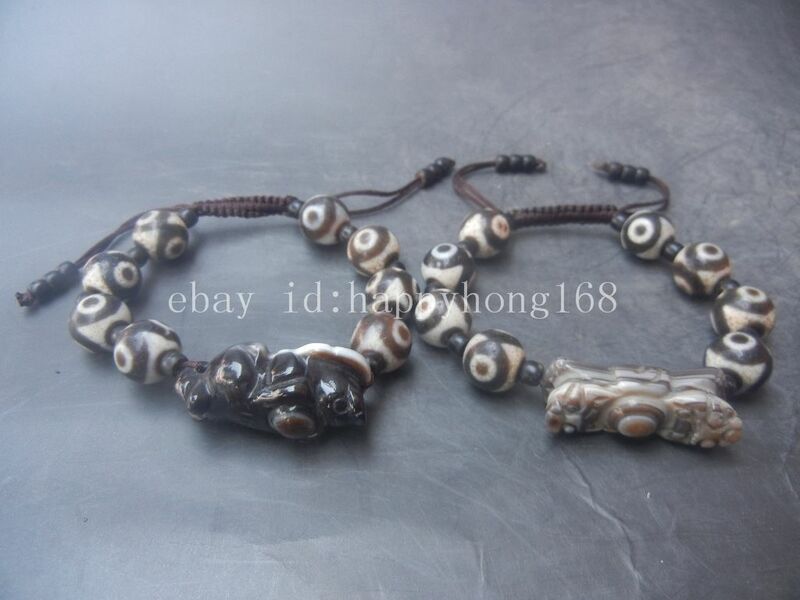 Mala that is quite possibly made from a human skull above, also being sold on Ebay, many times as just “bone” without saying it is HUMAN. Crystal has long been venerated by these people who love to carve rock for obvious reasons. See through like water but harder than most rocks out there, quartz stands the test of time and is seeming magical with its translucent qualities. 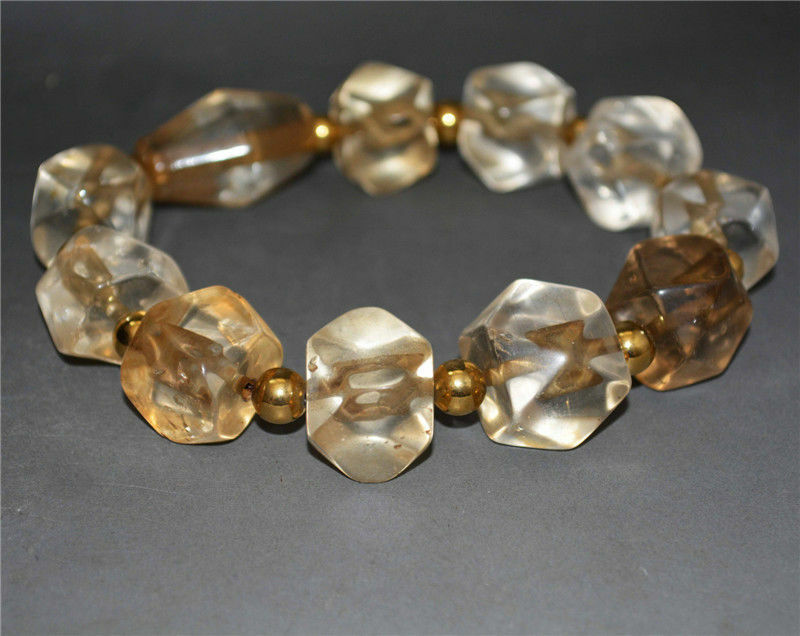 Citrine is extremely popular with monks, it is a form of colored quartz. Amethyst is also a form of colored quartz often used in prayer beads. 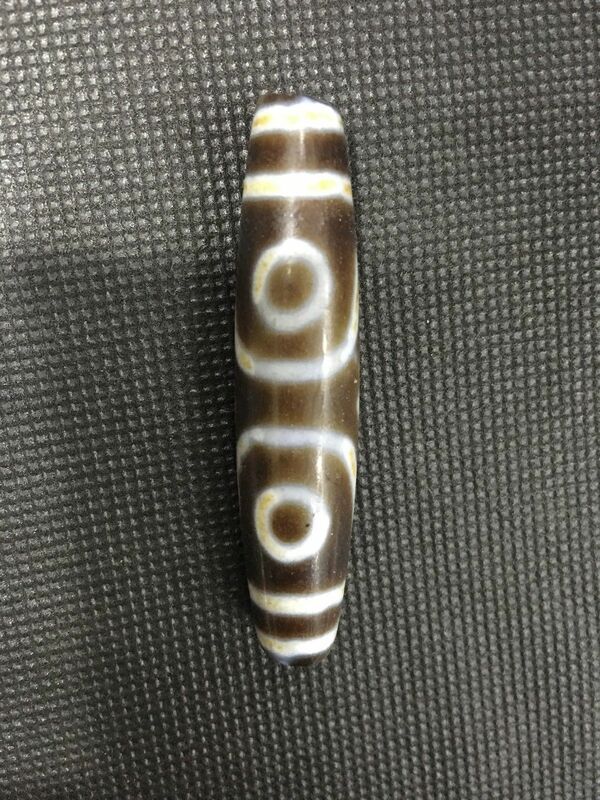 Many of the used beads being sold as brand new at rock bottom prices were once Buddhist prayer beads I suspect. These used hand-carved citrine beads are found in great numbers and most often found in an 6 or 8mm size, perfect for a reasonable size mala (as sizes of beads go up, the size of the mala itself increases since there are still 108 beads to count on each) that would be affordable to most monks. 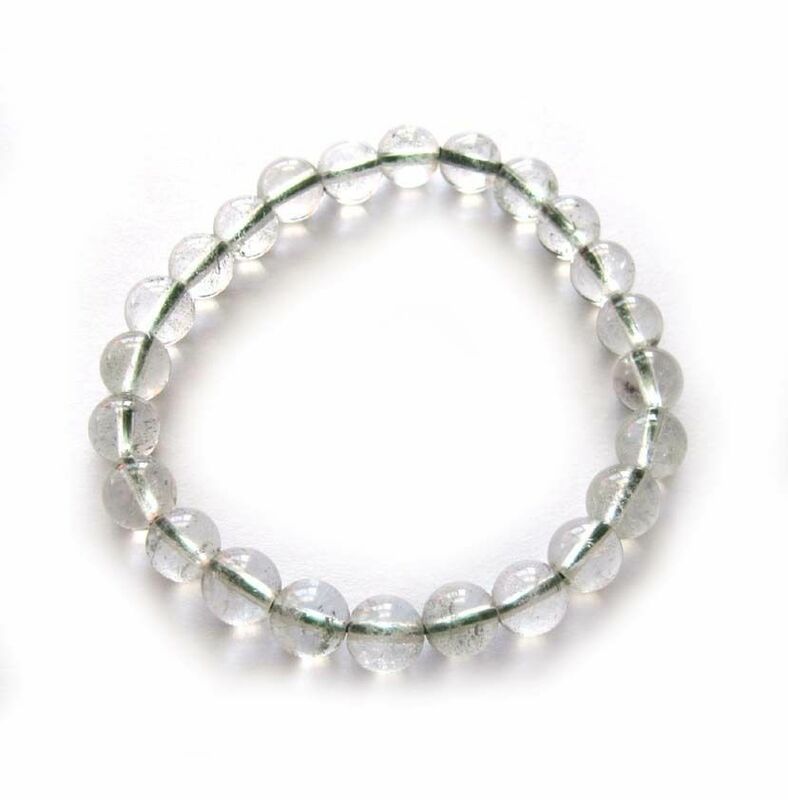 In addition to many other types of stone, crystal bracelets of all kinds are revered- clear, colored, rutilated quartz are all carved and worn. This bracelet seems to have not been cleaned at all as you can see in the photos, but are still being sold as brand new. 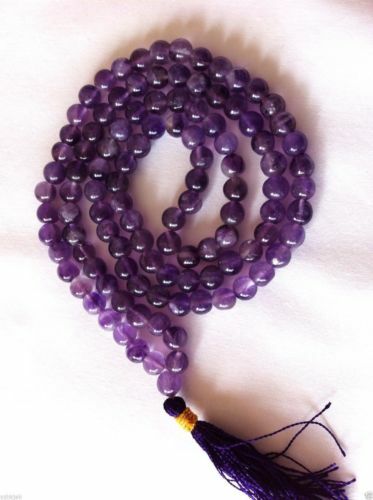 Amethyst Mala- this is how it is possible to sell handmade beads made from pure quartz that cheap- just steal from monks! 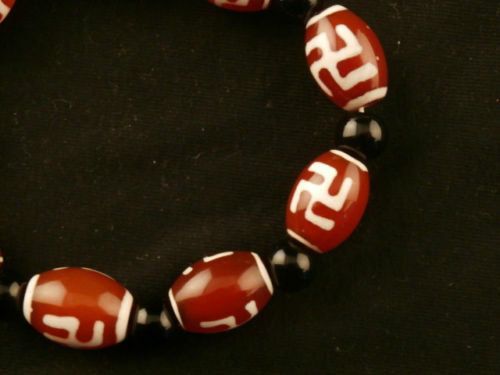 The antique prayer beads bring a pretty penny to the communists who have long oppressed these peaceful people, and the older beads (often covered in dirt still) are even more highly suspicious- if this could be possible- since their origin seems to be from dead monk’s graves/stupas. 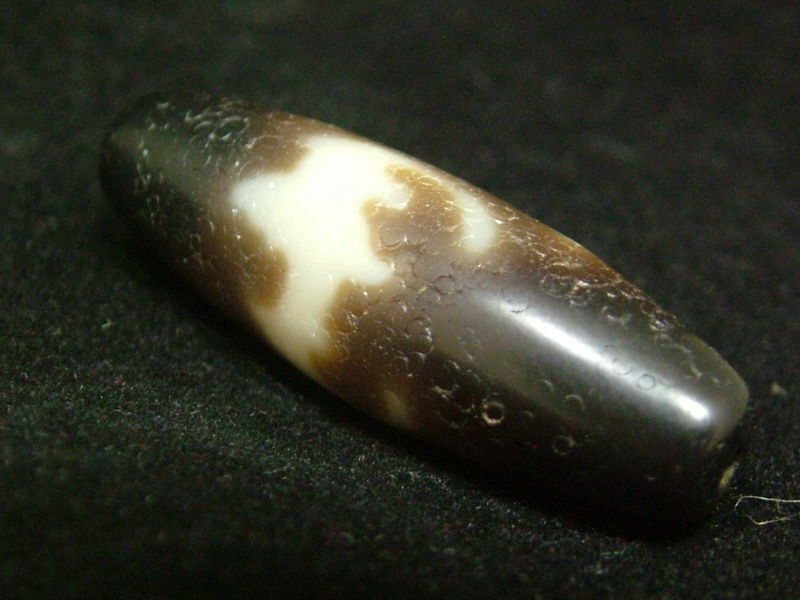 Other very hard stones typically used by Buddhists whose age can be deceiving include agate (carnelian) and obsidian (onyx). These beads in the shape of a squash or pumpkin are hundreds of years old, or even older. Squash and melons are a staple part of Chinese diet, the melons store well on their own, and are also often pickled to add flavor and preserve them for even longer periods of time, and are grown in lower elevation areas of Tibet too. Here is an even older set of carnelian squash beads that could predate Jesus Christ and Buddhism itself. 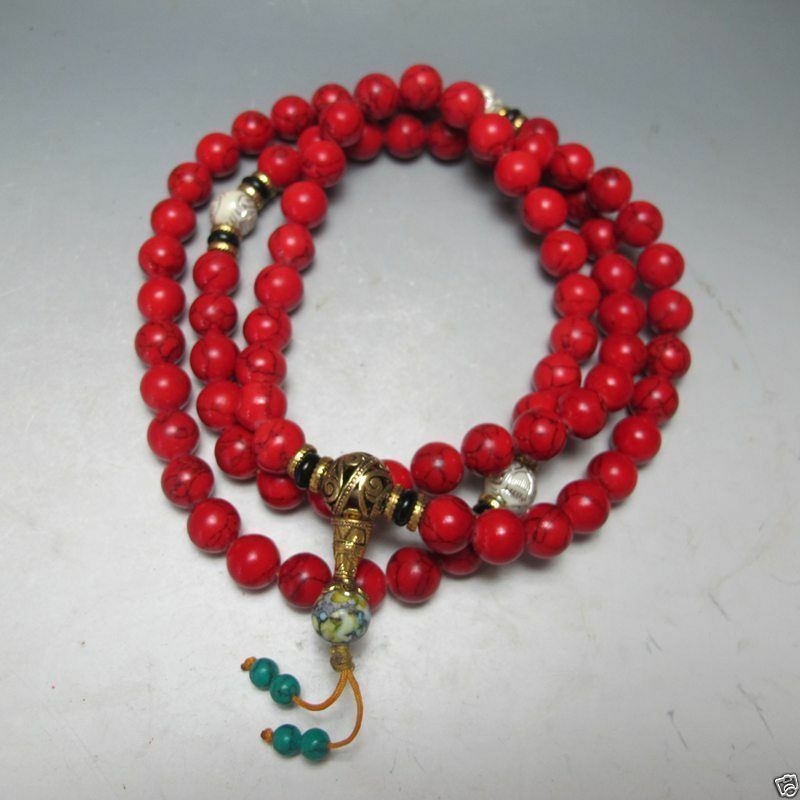 Typically Buddhist prayer beads are 108 beads like the strands being sold above. 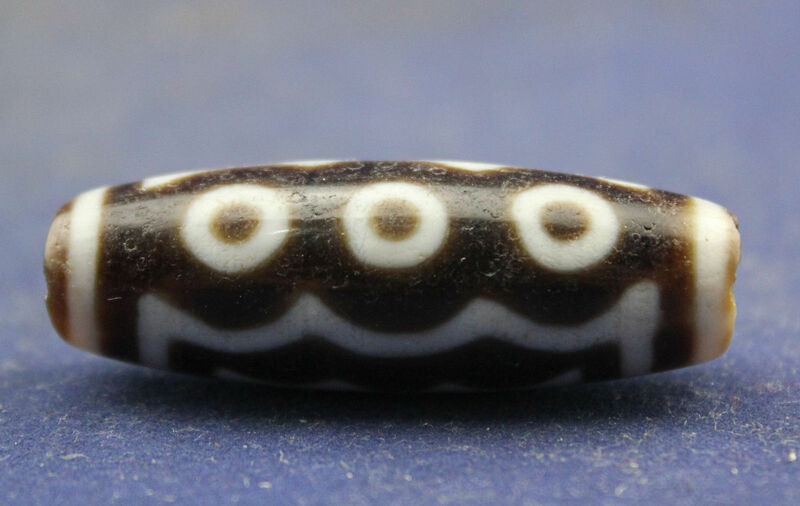 Stripe beads such as this were made apparently by cleaving the rock in 1/2, gluing back together using the same kind of ancient techniques found in the inlay of dzi beads. The amazing part about all of it, the inlay is just as hard as the parent stone. 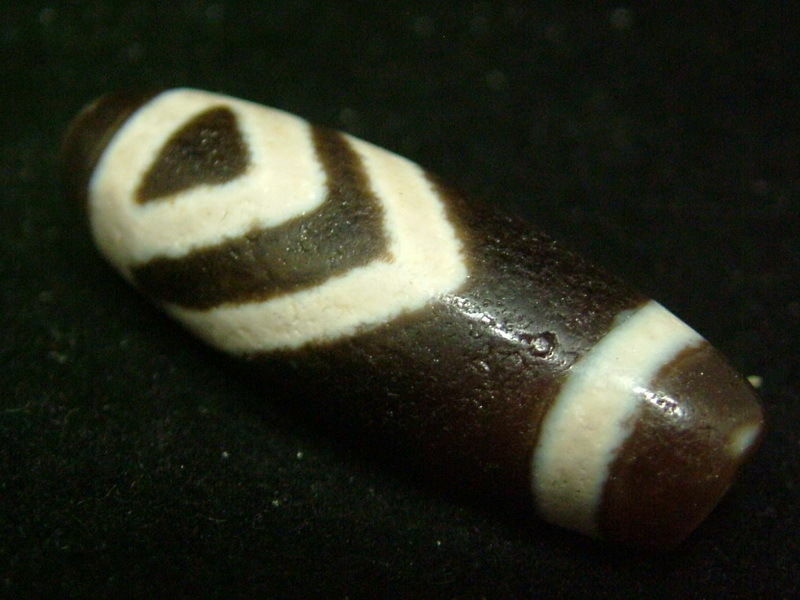 Dzi beads are a special bead that is believed to provide positive spiritual benefit. The most common design is an eye- a simple dot with a circle, but there are many designs ranging from simple to quite ornate. 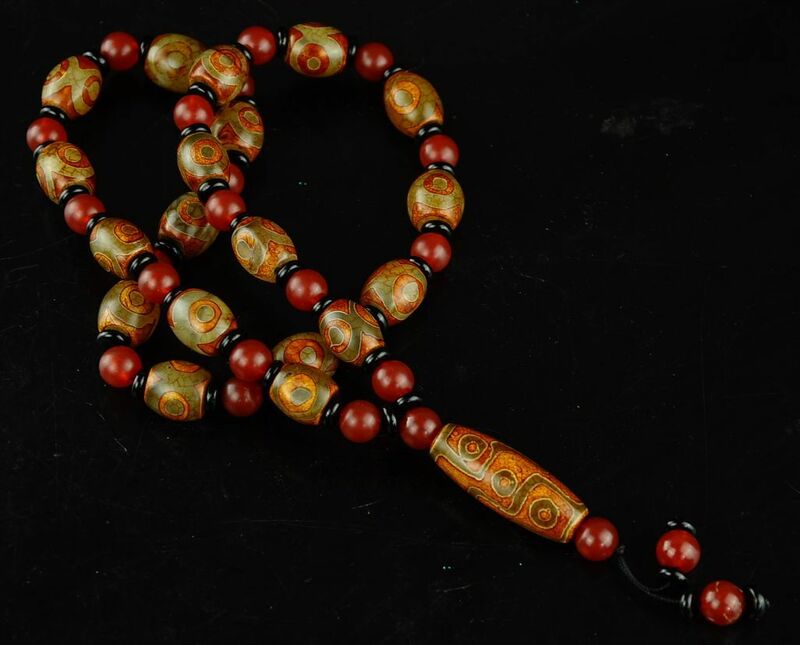 Before the Chinese started to roll out the Tibetan’s backlog of confiscated things, dzi beads were so rare that the Buddhists in China were buying fake ones from Koreans. They are made from carved agate that has been inlayed with designs, a very difficult and time consuming task that very few have any knowledge of today. I asked my dad who has always been a rock hound and even has a degree in mining engineering and a rock saw how these might have been inlayed, and he had no idea since they were agate. Never saw anything like it. The darker color tends to be the color of the natural stone, while white is inlayed into grooves that are carved. But what is the white material? 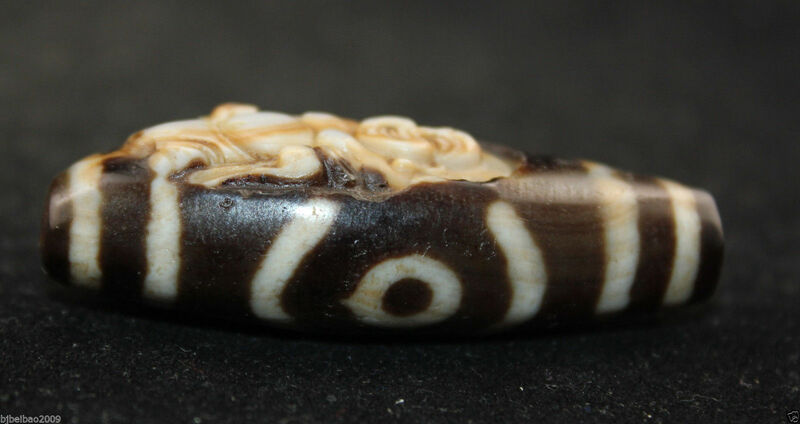 To answer that may be to answer the origin of the dzi bead itself, and if it is porcelain in the majority of cases, then dzi beads probably have a Chinese, not Indian origin as some believe and as stated on Wikipedia currently. 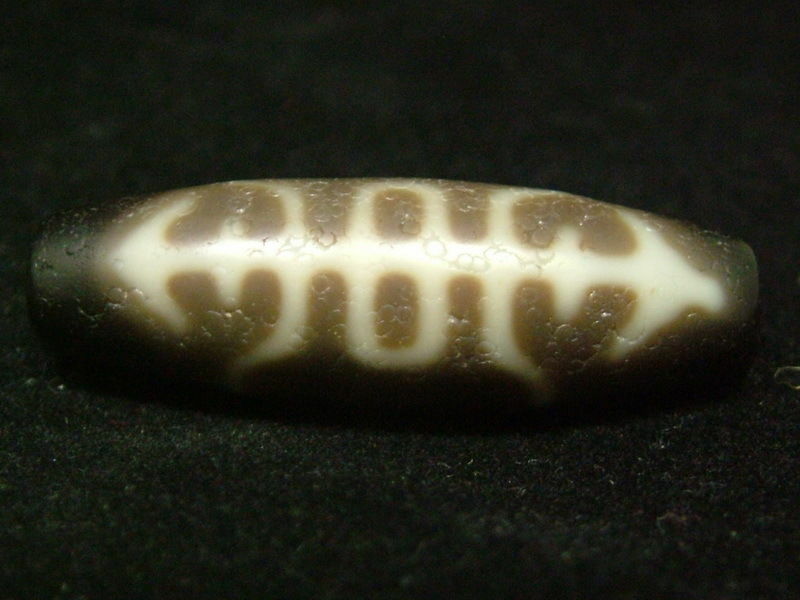 Also the fact there are oracle bone scripts- the oldest form of writing known in China- that are used on dzi beads indicate their origins are Chinese and even older than thought. 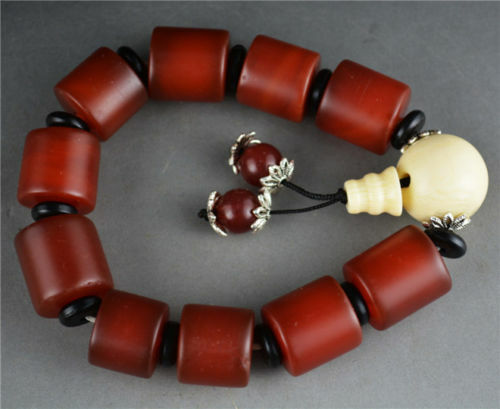 In 2010 Karma Samdup– a local Tibetan business man and environmentalist- was sentenced to 15 years prison for supposedly grave robbing, who had became wealthy by trading in these ancient agate dzi beads. 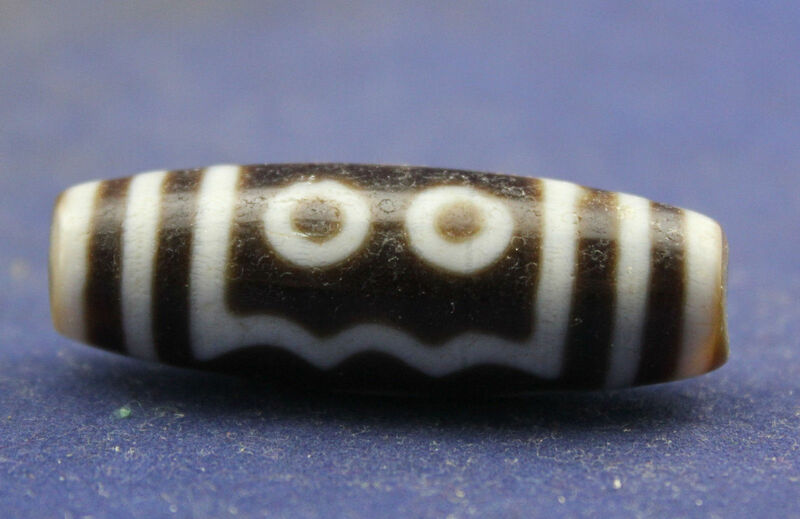 His nickname was “The King of Dzi”- and it is possible that many of these beads may have been confiscated from his collection or similar people. Though it is OK to stop grave robbers, to sell the looted goods afterward on an open market for a fraction of their value still isn’t. It is a desecration still of people and their things, and far better that they should be put into a museum than continued to be looted from the country and the dead. For this particular dealer alone mm888home there were 497 items in his Ebay inventory when searched for “dzi” on July 29th, 2015. This number has increased to 789 on December 9, 2015, 785 dzi bead items on 4/29/2016, and 868 on 05/27/2016. Not good when he also banned me from bidding after I tried to find out where his things came from. He also has any number of prehistoric artifacts from the stone ages as well as priceless pieces of pottery and other antiques that are inappropriately priced for the valuable and rare items that they really are. This is just not true. 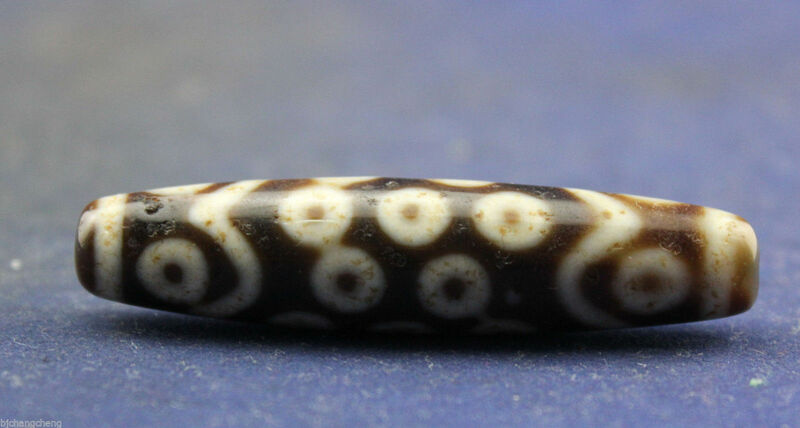 Though there may have been very few dzi beads before Ebay opened up to Chinese sellers, currently there is not one single dzi bead which I would deem as not being real- all real as far as I can see on my searches. Also many from graves that are hundreds if not thousands of years old (see oracle script written in one below possibly dating from Shang Dynasty some 3,000+ years ago). Once these were all attached to prayer beads or in bracelets, but the Chinese communists will often make more money if they split them apart and sell them single- strings are also the first things to rot away from time itself, especially in graves. 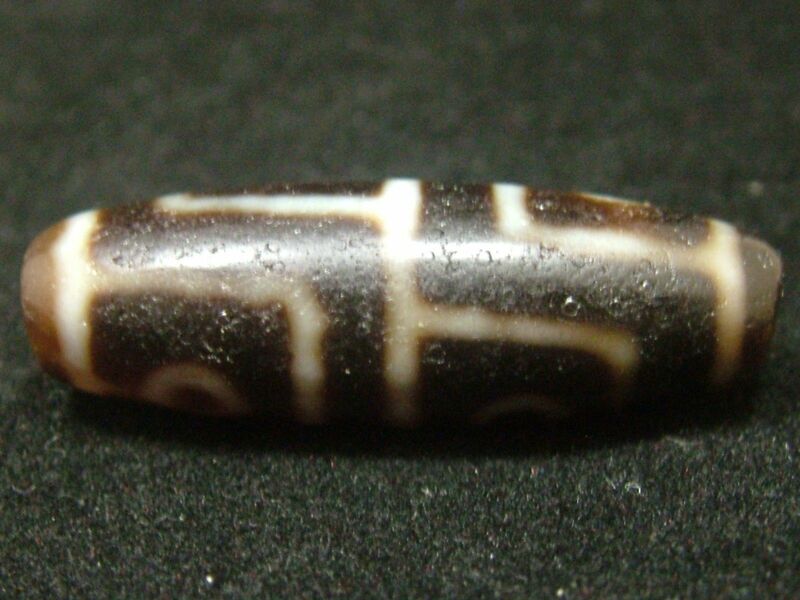 The dzi beads above have the shou symbol- symbol of long life, which also looks a great deal like a hieroglyph of “man” in the lower one. Hard to say if these predate writing or not, or perhaps even the first written words were formed here in this art form 1,000’s of years ago. 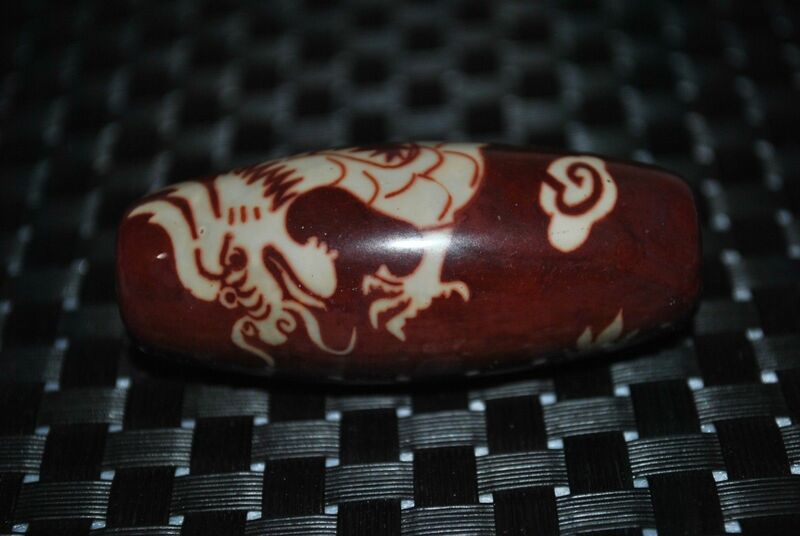 Something like the dragon dzi bead below would have been made relatively recently, while older beads have much more simple designs where the edges are not nearly as crisp. 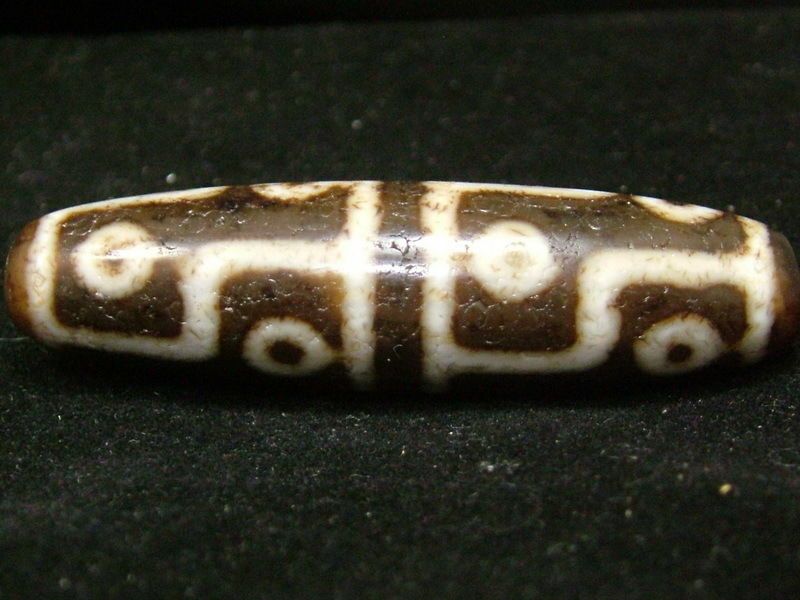 Another form of a dragon dzi bead, much older, with a raised design above, and an even older one below. 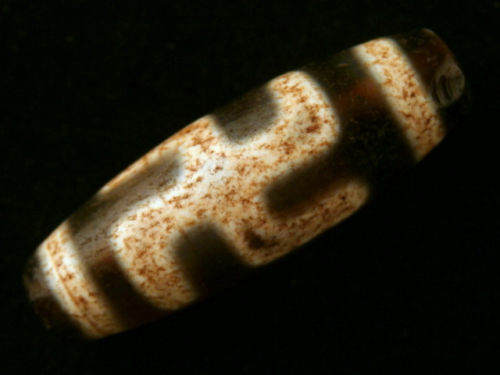 Though the bead below is sold as “dragon eyed”- it is actually a tiger- and written in one of the oldest scripts in the world. 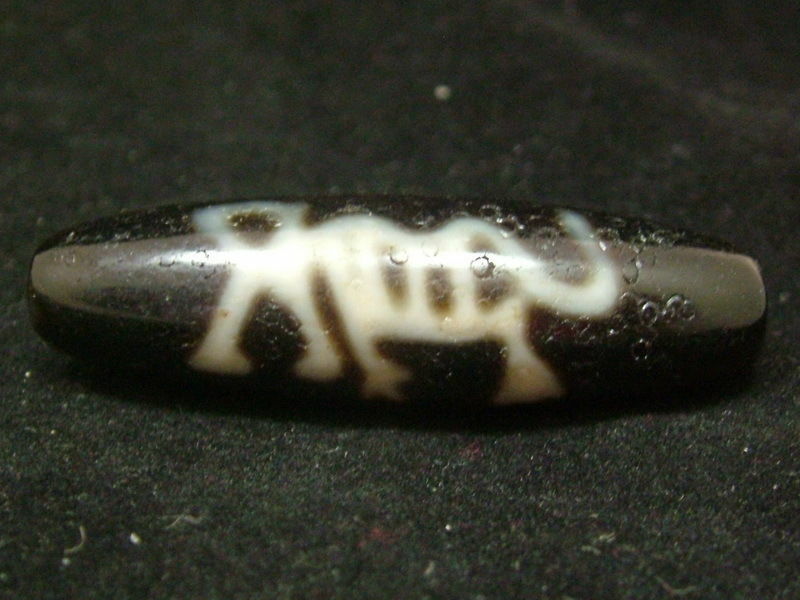 It is the earliest known in China called oracle bone script. 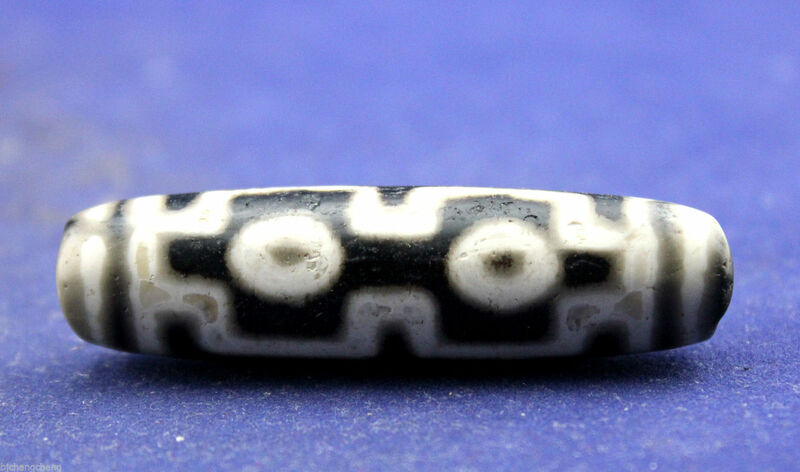 It was used in the Shang Dynasty- the very first in China- more than 3,000 years ago, which makes these beads being sold on Ebay for a couple dollars possibly as old as that. 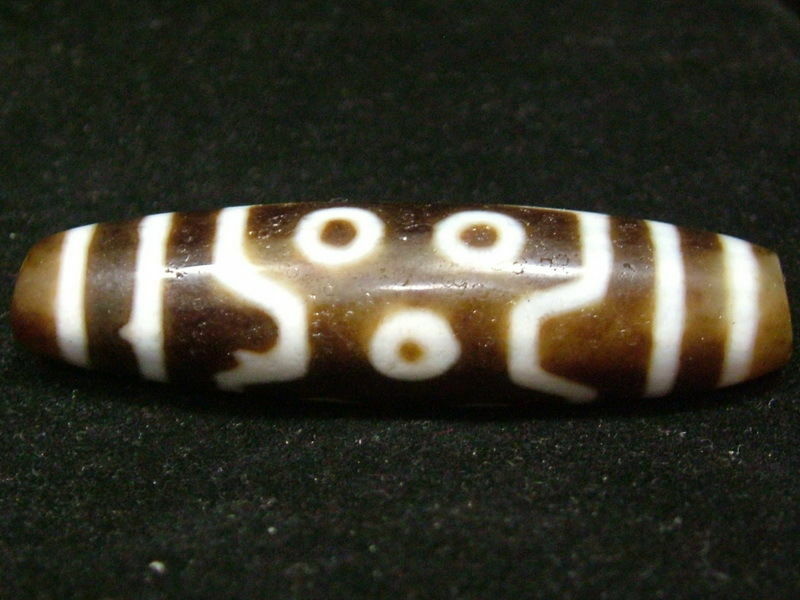 This Two “eyes” are also featured on the backside of the oracle script tiger bead. 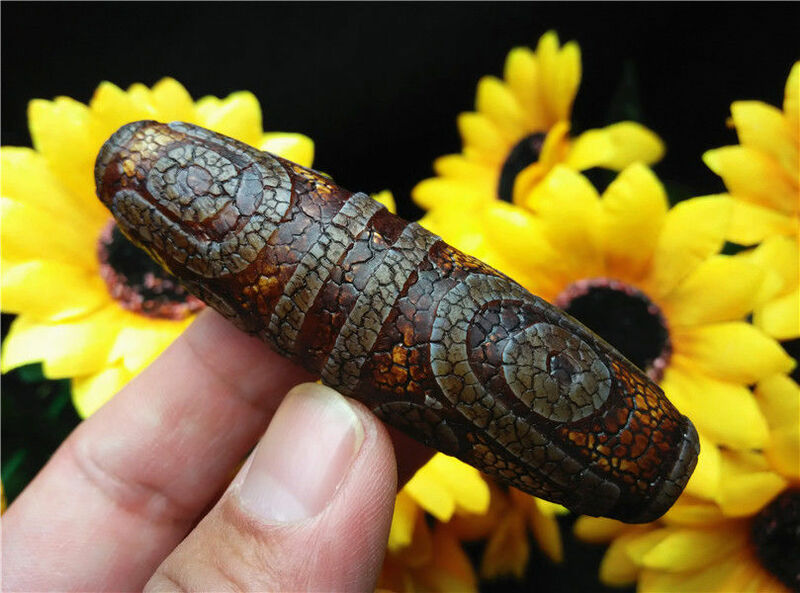 It indicates the origins of the dzi bead aren’t exclusive to Tibet or Buddhist monks, but are interwoven with the history of China itself. 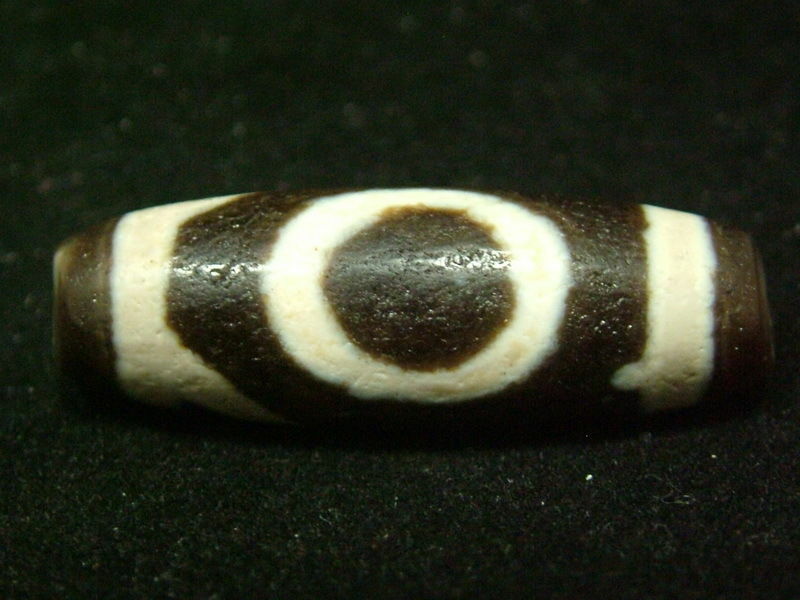 Although there is a wide range of symbols and images on dzi beads, one of the most common and ancient are “eyes”. There are many eye designs, ranging from one to 12 or more, which are circles, often with a dot or other circles inside of them. Dots are put together with lines and every bead tells a story of its own through this simple language that even the illiterate might be able to read. 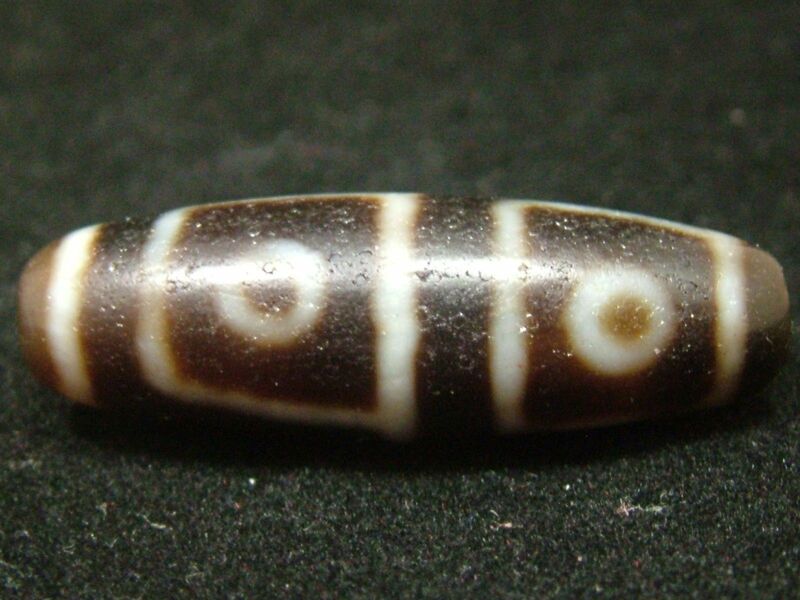 The one eyed dzi bead above with a triangle or mountain design on the reverse which could be symbolic for the sun and mountains or earth. 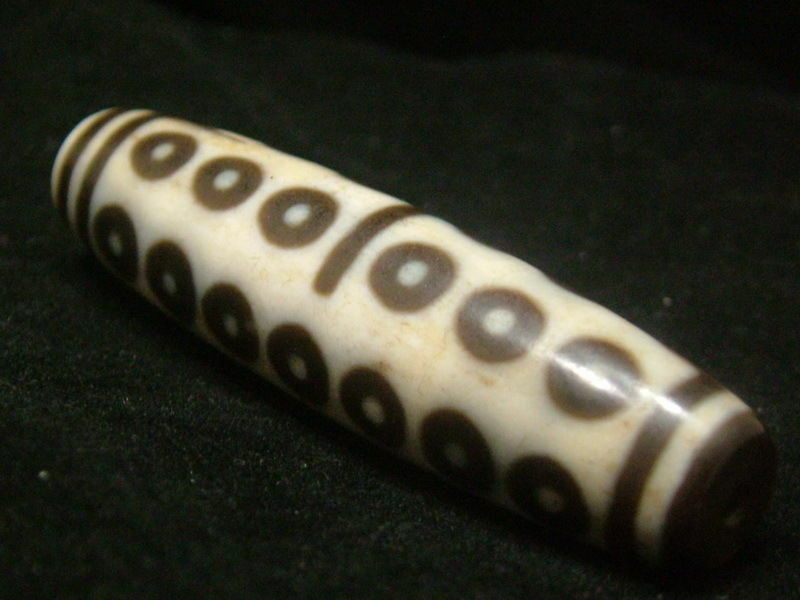 Two eyed dzi bead above, a similar eye is on the other side. Three eyed below, again with a hidden eye on the backside. 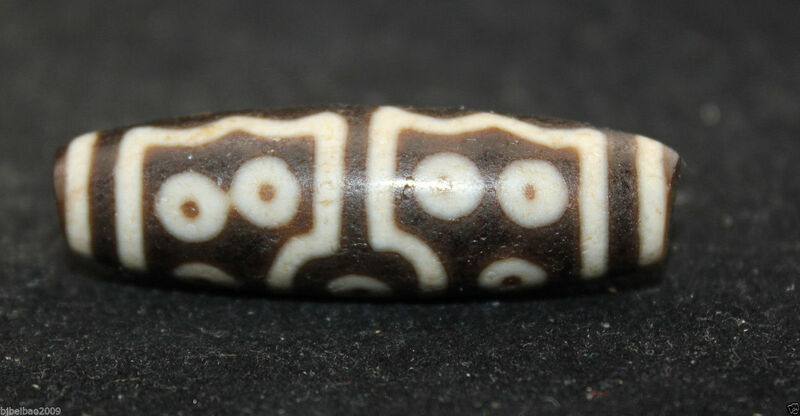 Ancient 8 eyed dzi bead shown above. 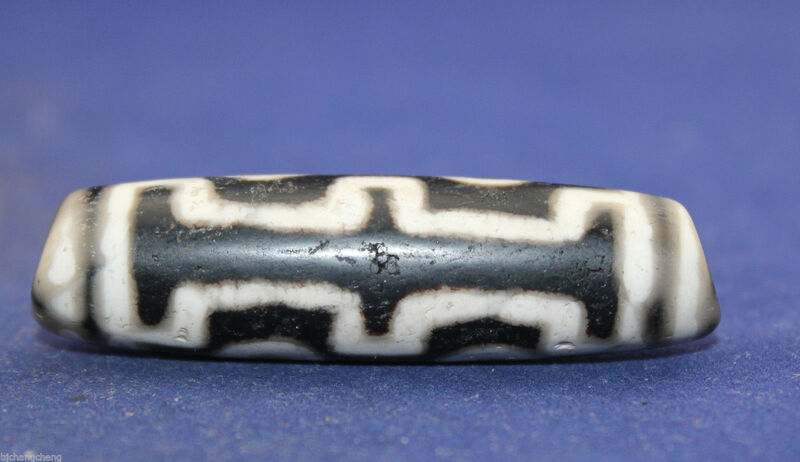 It is unknown if these types of dzi beads that are so cracked are older than other ones, or if they are made from a different type of stone and inlay material. 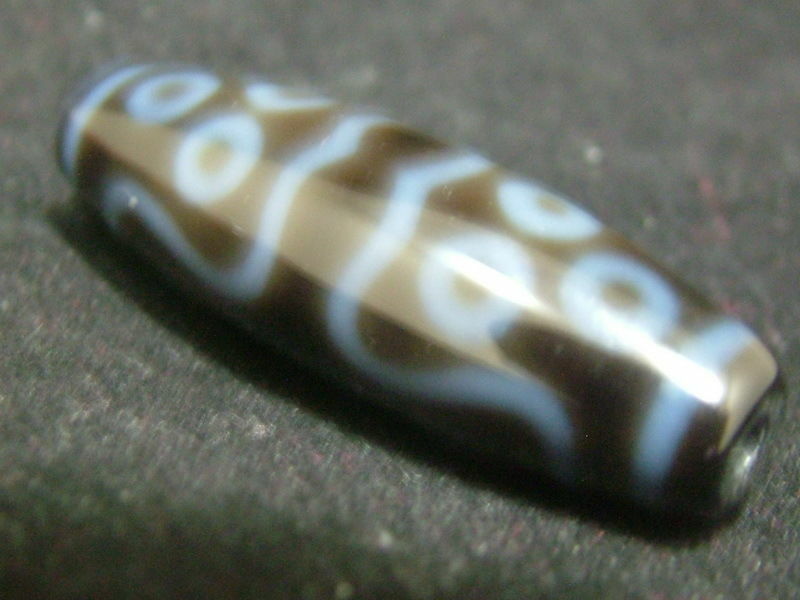 A common type of 9 eyed dzi bead pattern with “steps” shown above and below. The one above is far older than the one below and has an extra stripe at the ends of the design. 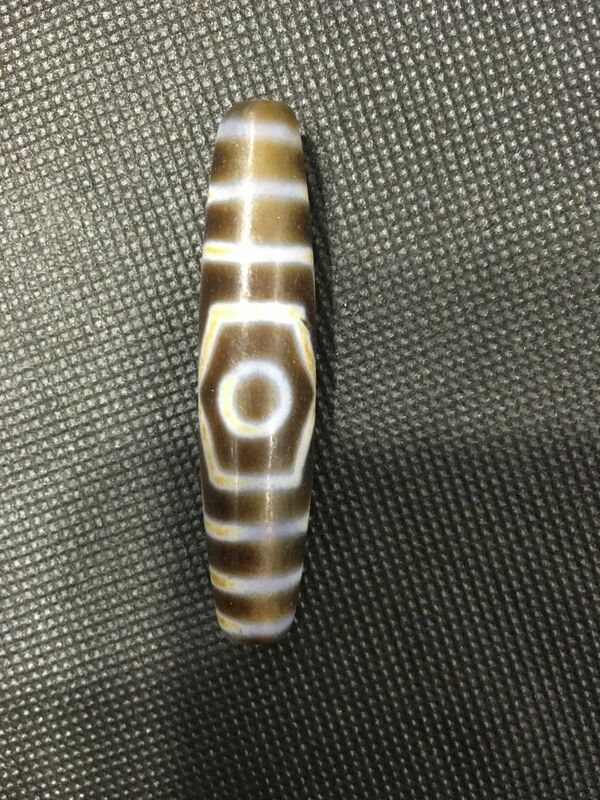 These nine eyed dzi beads are by far the most common type being sold. Where did all these beads come from, so prized and so treasured by Tibetans and monks for centuries? The Chinese police and military have regularly confiscated everything people own out of their homes and persons, as well as apparently robbing many, many ancient graves. 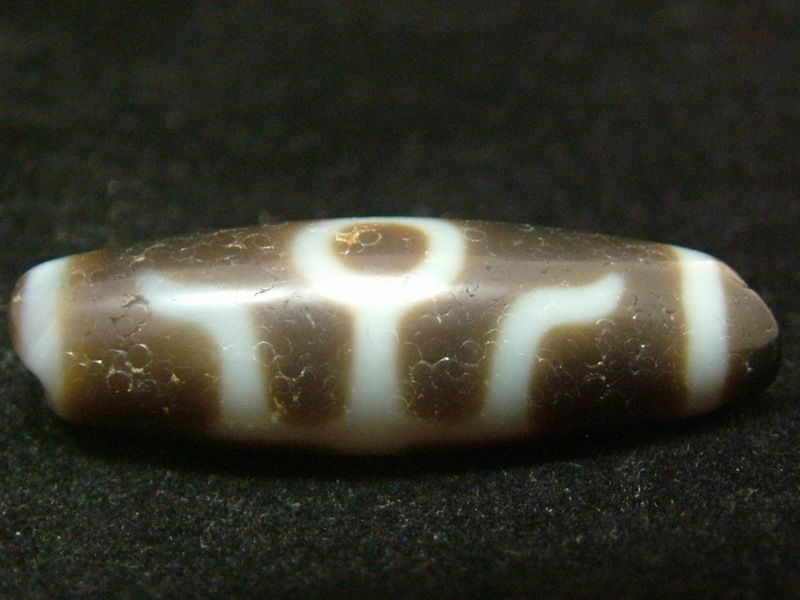 The 9 eyed dzi bead below has a surface film on it typical of being buried in arid regions. 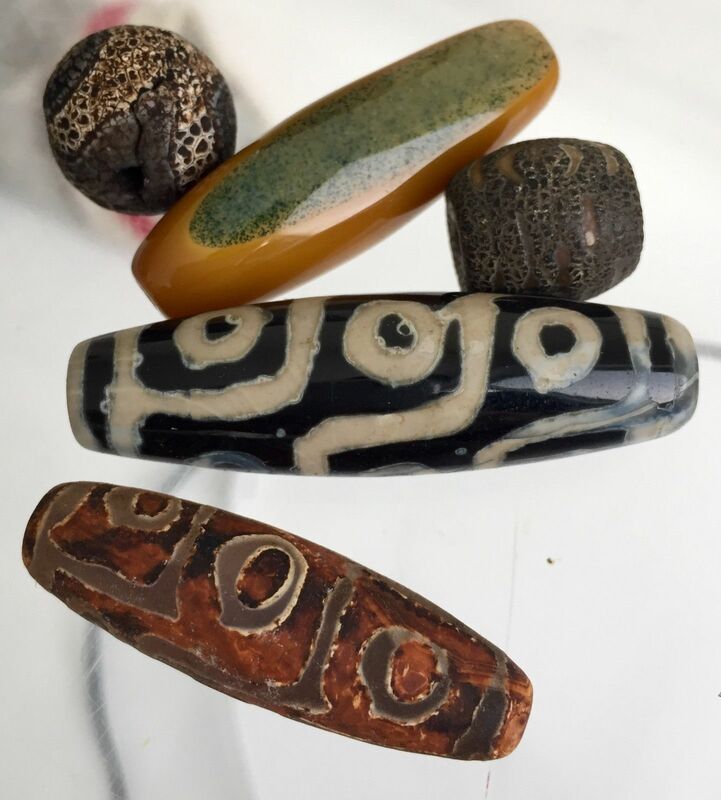 Huge sized 9 eyed dzi beads that may have came from monasteries. 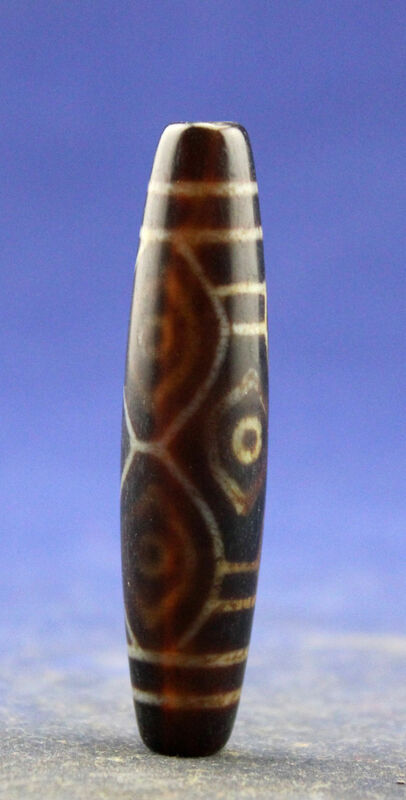 9 eyed dzi beads with a honeycomb pattern above. 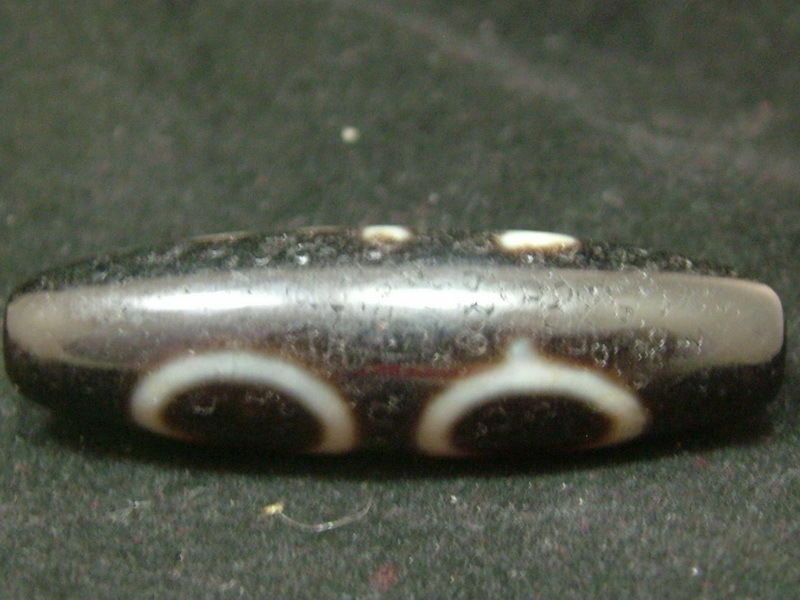 The bead above is called a 32 eye, while the bead below is called a 33 eyed by some sellers- both appear to be the same design though, and someone has miscounted the eyes. It must be reiterated that the price that Tibetan and Chinese things are currently being sold at on Ebay is not a fair assessment of the value of the item, particularly for insurance purposes or even for resale. These are the devalued prices that have occurred because of tremendous flooding of the market by the Chinese, as well as the fact that they won’t give a real provenance to any of these items- if you ask about them and want specifics, the sellers are make statements like “Big Tibetan Market”, but you never can get addresses or names to actually follow up on. For anyone who knows the plight of Tibetan monks in the hands of the Chinese, something must seem fishy particularly at these prices and this volume, so many honest buyers stay away if they can at all put two and two together. There are many “speculators”- a small group of unscrupulous people who know the true value of items who are there to buy as much as possible to resell at a higher price, and these are mainly the purchasers I believe (besides a few random people who just wanted a bead or two and didn’t really know what they were). When that many sacred items are just being transferred from one selfish person to another while they are making a killing (literally), there is something really, really wrong in the world today. What was it people believed in these days? Was it just ME, ME, ME??? How is this better than God or Buddha? 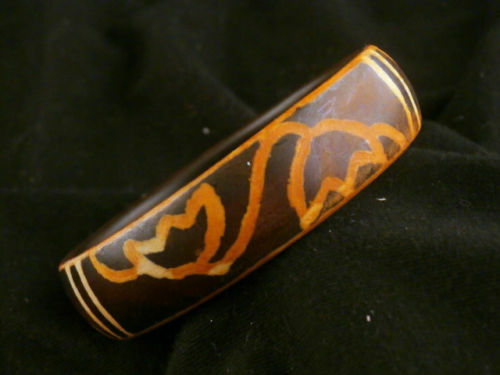 Something like this agate bracelet which has been inlayed with the design of lotuses, an auspicious Buddhist symbol would have probably came directly from the grave/stupa, and the discoloration of the design may be because it was buried, not just age itself. 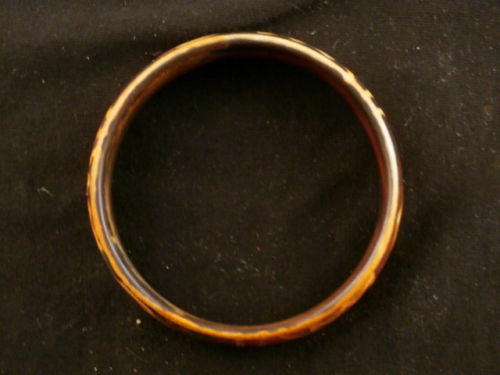 Another indication of its extreme age and Tibetan origin is its size, at a diameter of about 182 mm, this would be a very small bangle, particularly if you consider they may have been worn by a man. Malas made entirely from dzi beads are very rare an expensive to begin with, made of agate that is carved and inlayed with materials as hard as the agate itself for many centuries, and keep in mind they don’t actually make dzi beads in Tibet anymore, but import fakes in from Korea these days. 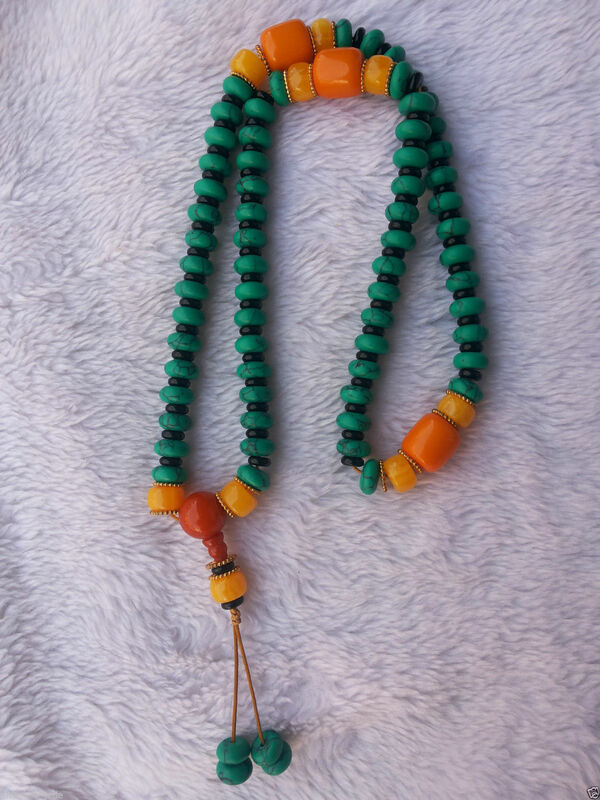 Also the “malas” featured below do not have the ordinary number of 108 beads for Buddhist prayer beads or even 99 and 33 for Muslim prayer beads, and have just been restrung from old used beads for resale. 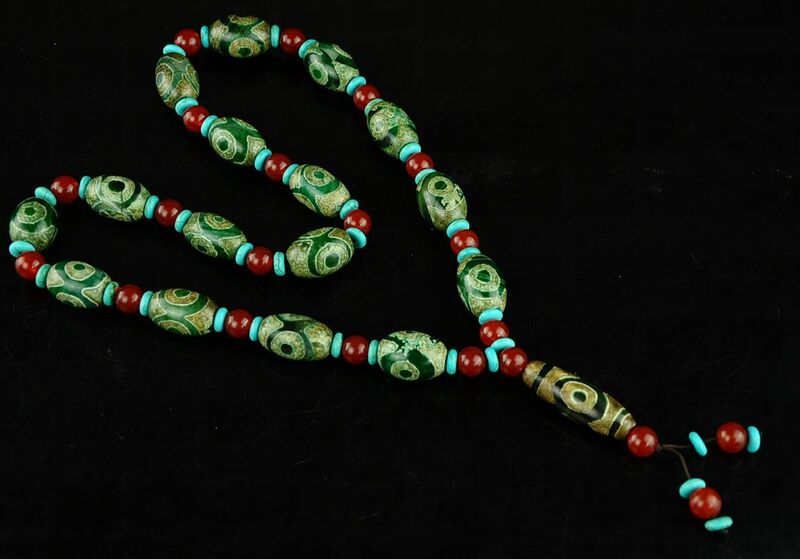 Typically in Tibet you find people with many more mixed beads in their necklaces, and just a couple dzi beads. 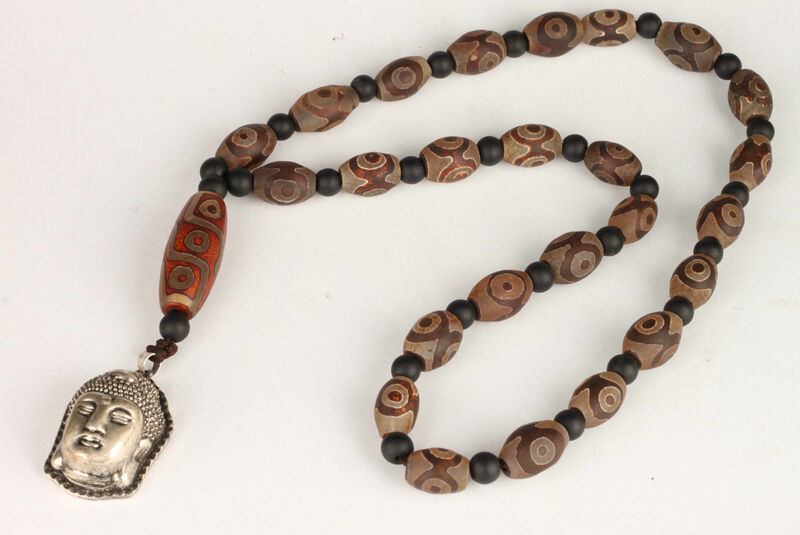 The dzi beads that make up these necklaces are 3 eyed, while the end beads next to the tassel is 9 eyed. 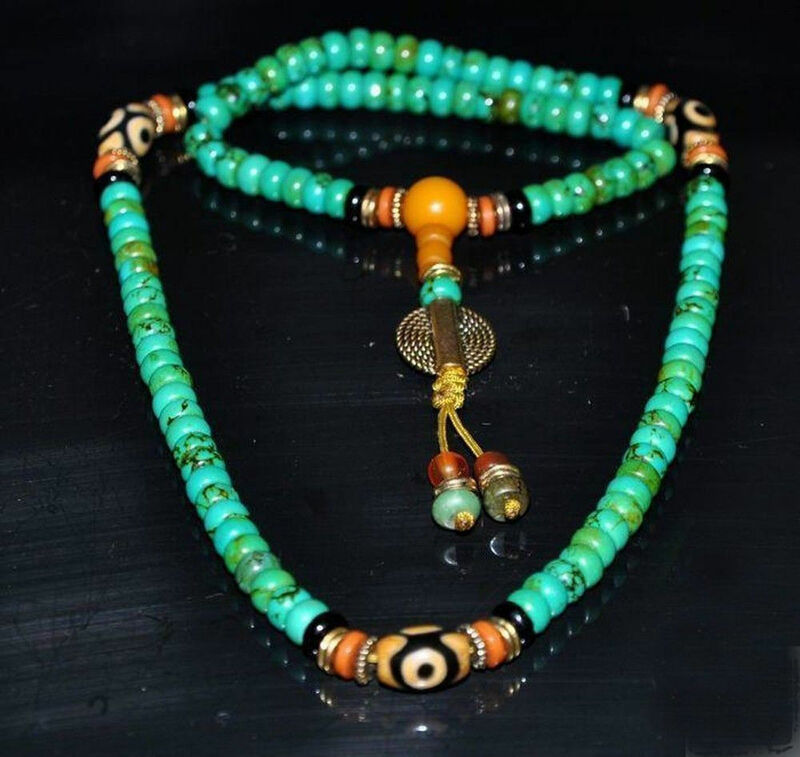 This is the most common design and arrangement when strung in a necklace, partially because these simple and common three and nine eyed beads bring less money when sold individually. Green is a very unusual color for the agate to be to begin with, and may be actually be glass or dyed agate. Two bracelets. One is an auspicious ox (yak) and the other is quite close to a NW Coast soul catcher form with two heads coincidentally. 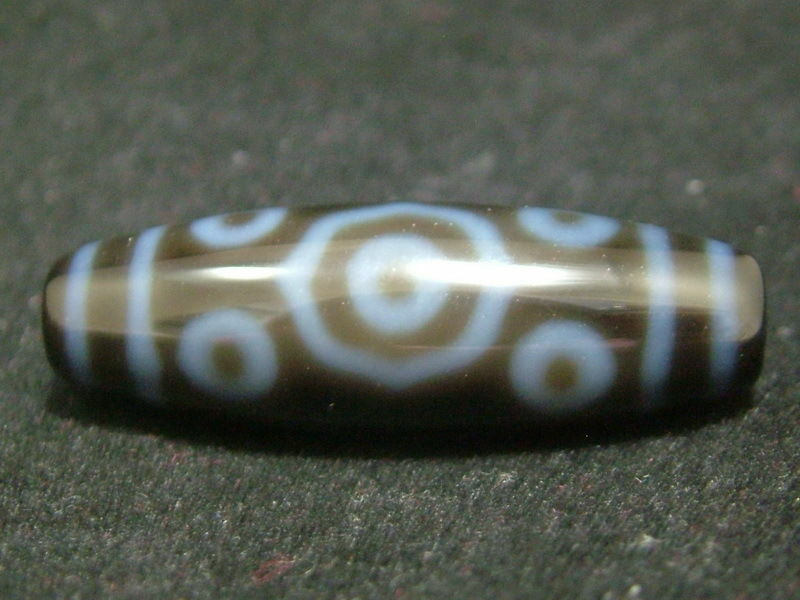 The blue and white beads below may either be glass or resin. Not sure. 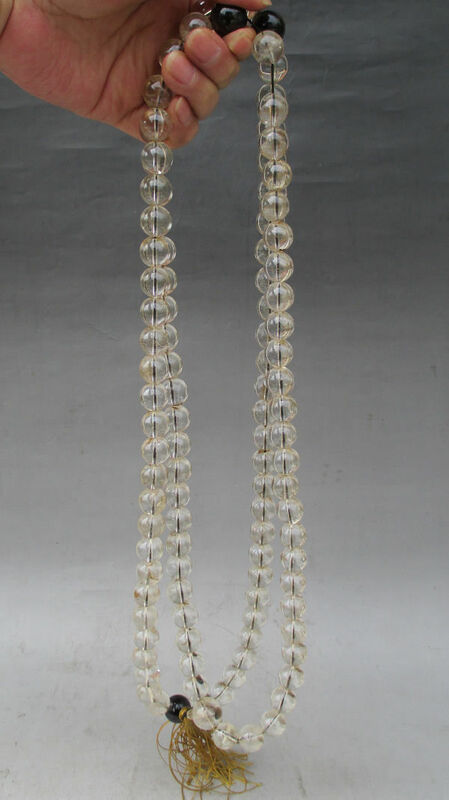 Also glass is used to simulate the traditional agate beads, these are only colored on the outside, the glass itself is a clear color which you can see through the chipped holes in the right light. 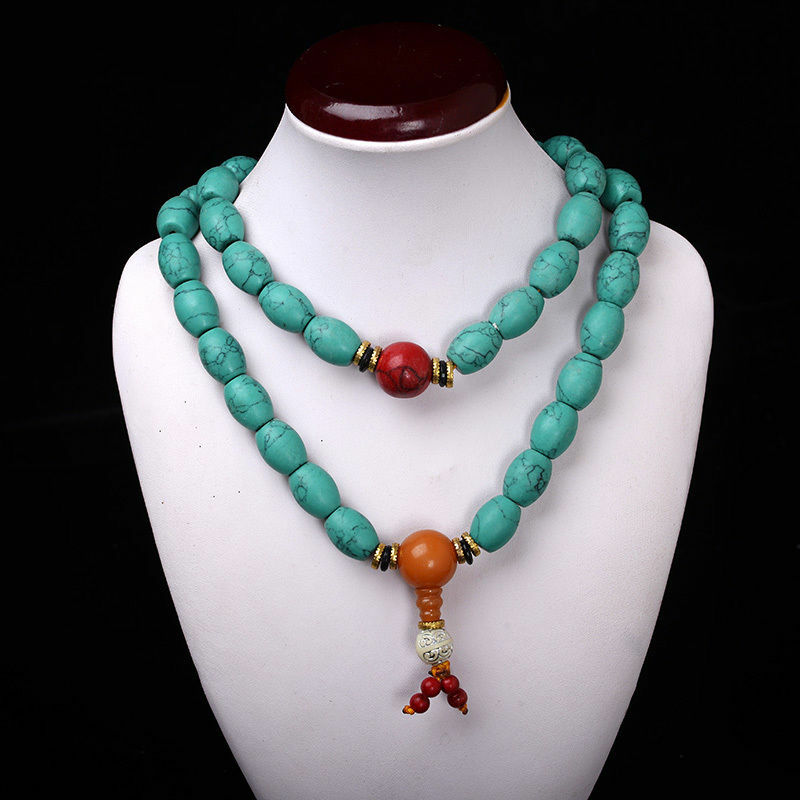 Three colors of Tibetan “turquoise” are the most common- red, white and blue. Red shown here. 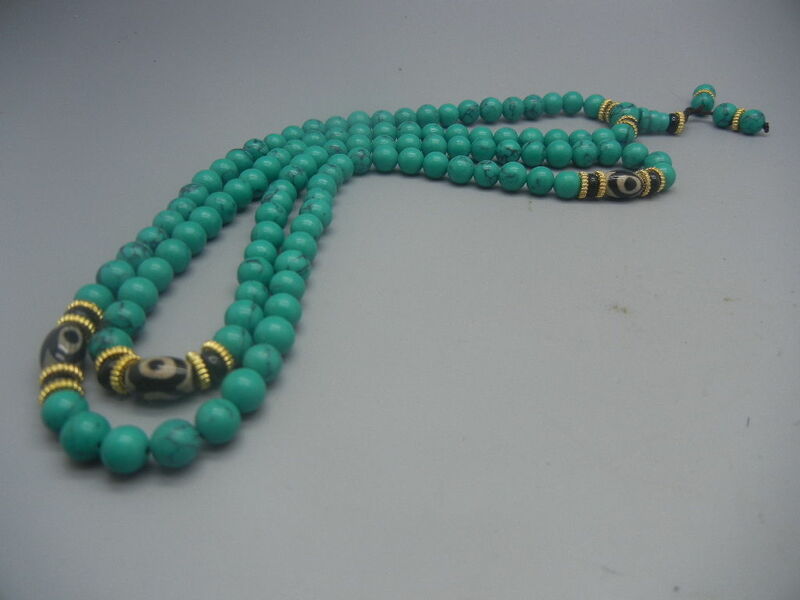 Many of the necklaces that are being sold as “prayer beads” or Buddhist malas do not have the correct number of beads- 108, and have been restrung from various necklaces that have been confiscated over time. The white, blue and red “turquoise” are all a synthetic stone made by Tibetans for many millennia. 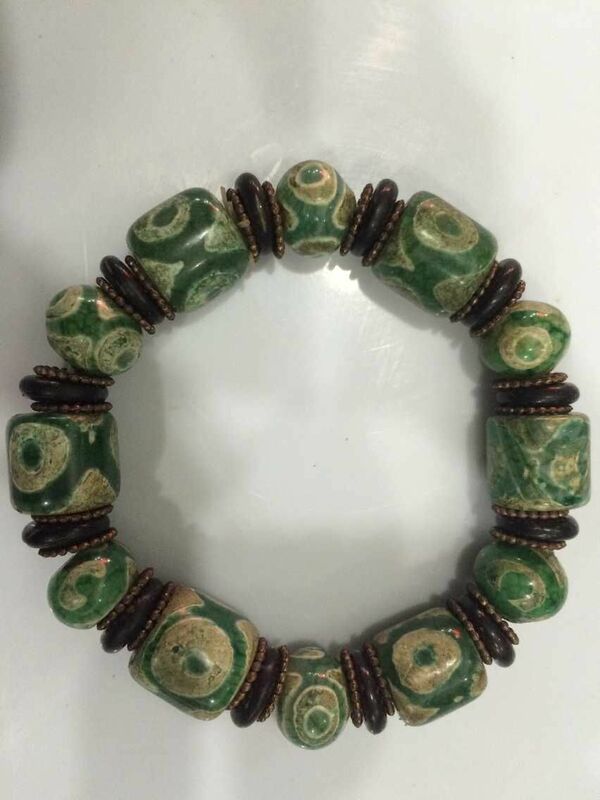 Some of these beads- though they look new in the photos that are repetitively used by multiple sellers- may be quite ancient, and dug up from graves and/or other material remains like many other items being sold by the Chinese. Two different forms of synthetic turquoise- undyed- shown above and below. The example above is less porous than the stone below, and the cracks are darker stone color above, while below the cracks are real cracks in the surface of the stone which have subsequently gathered more dirt over time. Though many strands are being sold as brand new, if you look at the eyes of the carved skulls below- they tell quite a different story and appear to have been buried for a while in an arid place to develop a surface layer of salt over the old dirt. But apparently no one could tell that these people were working together and connected to recent historical events? Look in each of their shops at the rest of the goods. There is a repetitive pattern of the same goods appearing over and over again, being sold by the exact same photograph in many cases. For a country with a population the size of France, the Tibetans sure are keeping the Chinese in business. That’s what happens when you annihilate millions and steal their stuff then have to sort it all- this isn’t just from a couple Tibetan down on their luck in need of cash or confiscations from a couple rowdies in the bunch- you end up getting many multiples of the same items and sell them for less than what it would cost to make them new.